For my throw sized blanket I used 11 skeins of Stylecraft Special DK (in shades Parchment, Meadow, Fondant, Sherbet, Aspen, Apricot, Candyfloss, Lavender, Aster, Lipstick, and Pale Rose for the border). It was a close call though, so if you plan on making something larger than a throw I’d definitely get two balls of each color (but you could still just get 1 for the border color). You can use any colors or indeed any kind of yarn that you would like! 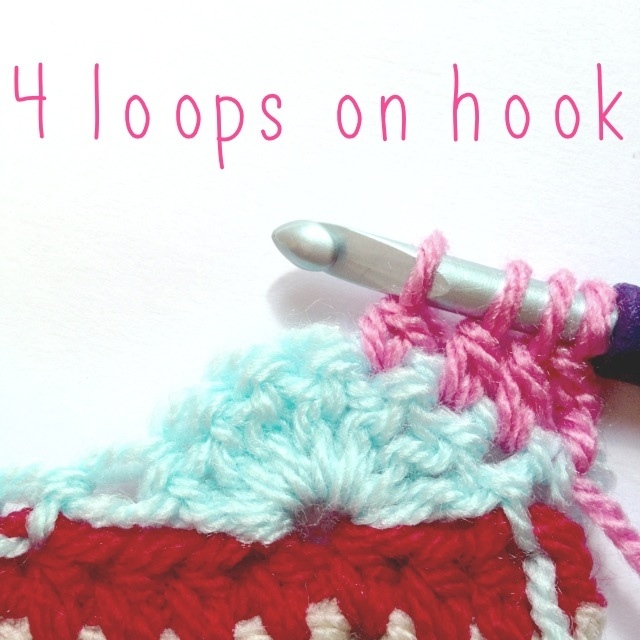 Hook size H/8 (5.00 mm), or whatever hook suits your specific yarn. Begin by chaining any multiple of 24 (i.e. 96, 120, 144, etc., and don’t chain too tightly!). Then chain 2 more for our turning chains. With my DK weight yarn and my H/8/5mm, I chained 194 total to make my throw about 50″/127cm wide, but you make yours however long you want to! As long as it’s a multiple of 24 plus 2 you’re fine! Double, no, TRIPLE check you have the right number so you don’t have to start over later! 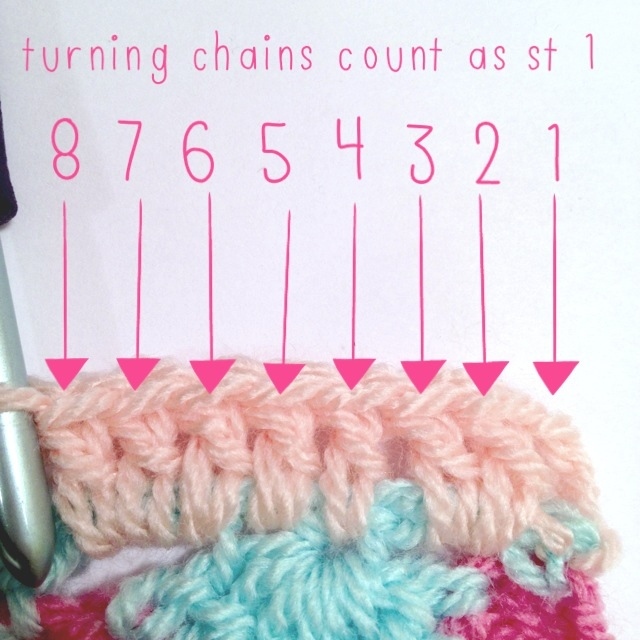 Edit: I should also say that because the 2 turning chains count as your first hdc, you should have an odd number of stitches for every row in your blanket (you will have a multiple of 24 + 1 stitches). So for example, since I chained 192 + the 2 turning chains that count as 1 stitch, I will have 193 stitches in all of my rows. 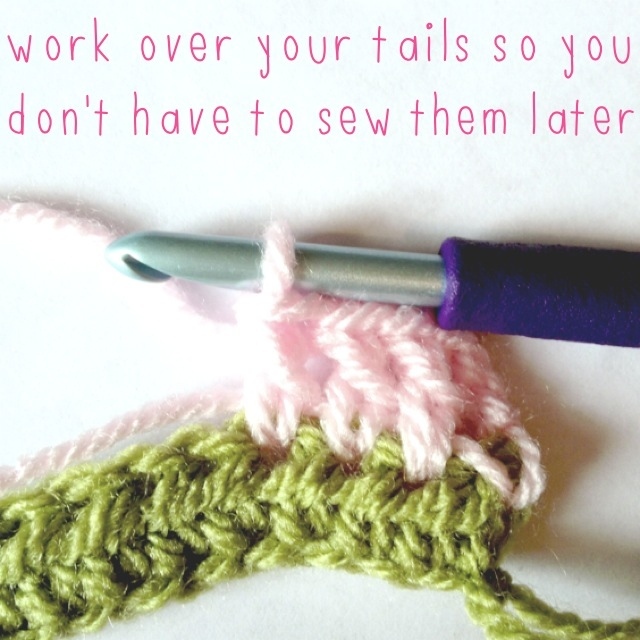 I like to crochet over the tail for at least 5 inches before snipping the end of it. At the end of this row, pull your next color through, ch 3, and turn. Continue this until the end, making only 2 dc sts in the last st of the row. Pull next color through, ch3, turn. Change colors. I’m using the same one as row 3. Ch 3, turn. 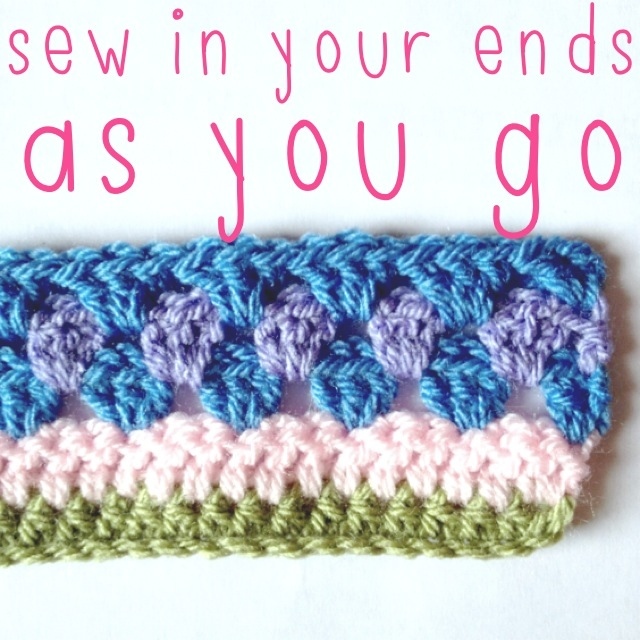 Don’t leave your ends unwoven til the very end, or you’ll never want to do them! I suggest doing them after about every 6 – 8 rows. 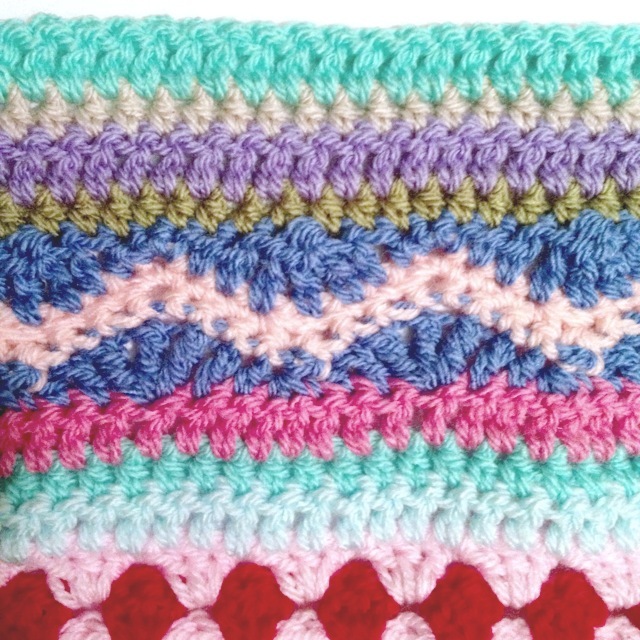 Before moving on to the next row, count your stitches to make sure you have the same amount as when you started the blanket. ch 3 and turn with new color, dc across. 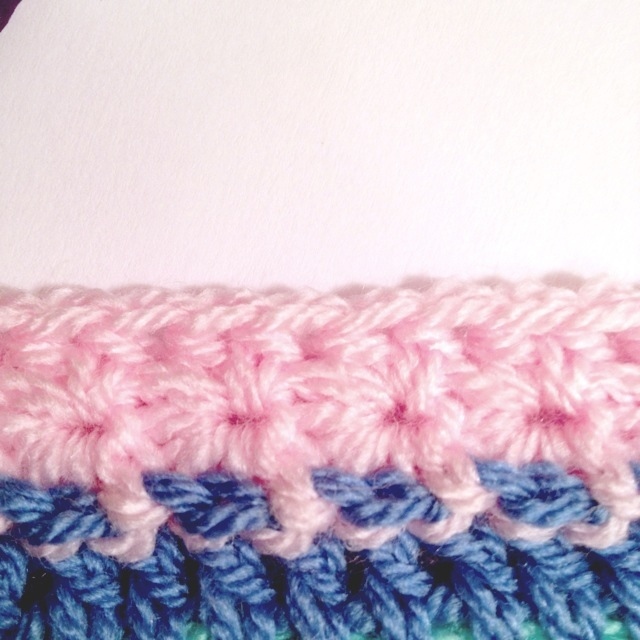 This row begins the star stitch pattern. I’d recommend choosing a lighter color so that the stitches really show up! 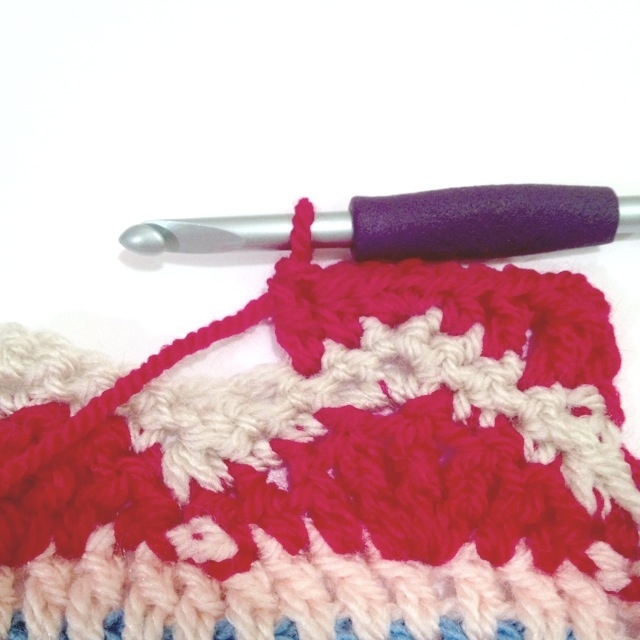 Each time we make the star stitch pattern, the first row of it needs to be on the right side of our work. Yarn over and draw through all 6 loops, ch1 to close the star and form the “eye.” Continue in this same way (pulling up loops through the eye, around the last spoke of previous star, in the same st as the last spoke of the previous star, and in the next 2 stitches, and then chaining 1 to close the star) until the end. This is why the blanket has a front and a back to it. Next, ch 2 and turn. Ch 3 with new color and turn. If you count, however (which you really should do now), you should have the same number of stitches as your very first row of the blanket. With new color, dc across. 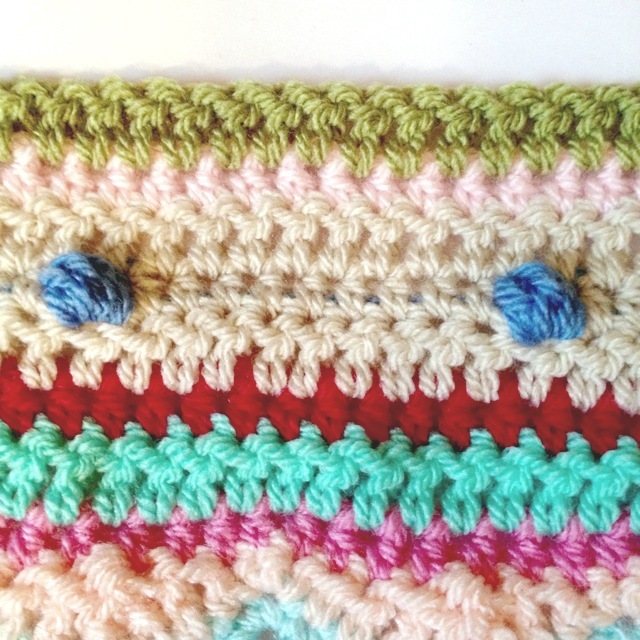 With 2 new colors (or 3 if you prefer), make another section of granny stripes. 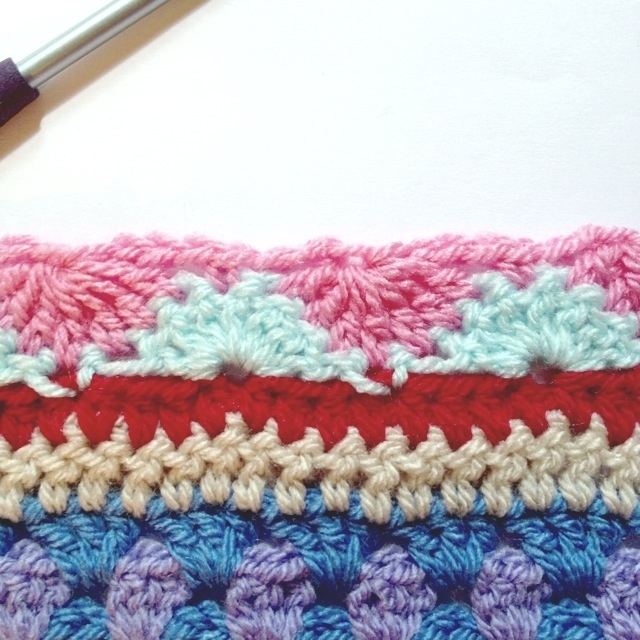 When we do granny stripes we also want the first row to be on the right side, and we must do an odd number of granny stripes or we won’t have the same number of stitches across (weird, I know, but the even granny stripe rows just don’t have the same number of stitches). With new color, hdc across. Do not change colors. 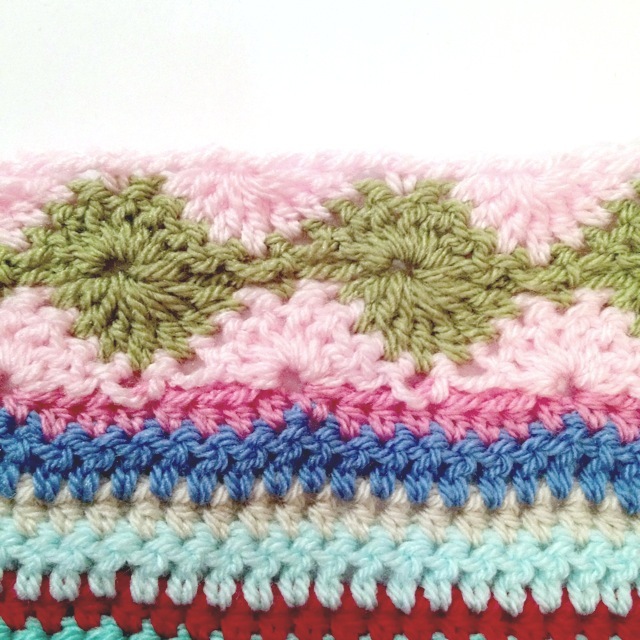 This is a row of hdc with bobbles interspaced. 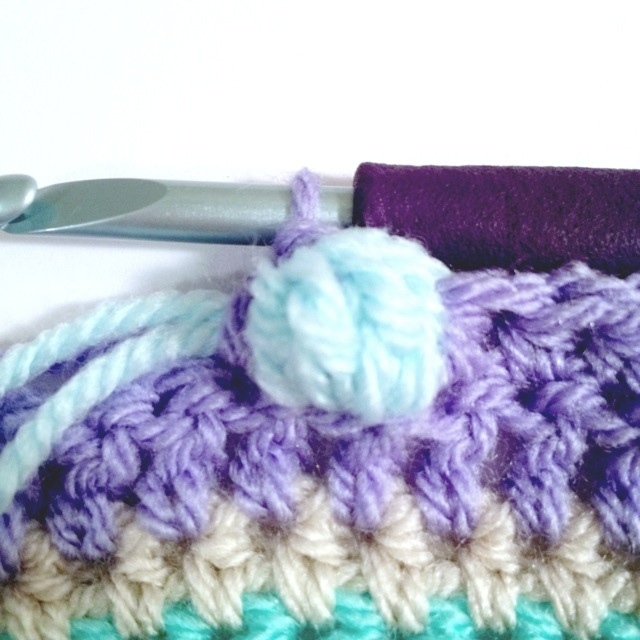 You can space your bobbles however you like, but I’m personally putting 9 hdc stitches in between each bobble. 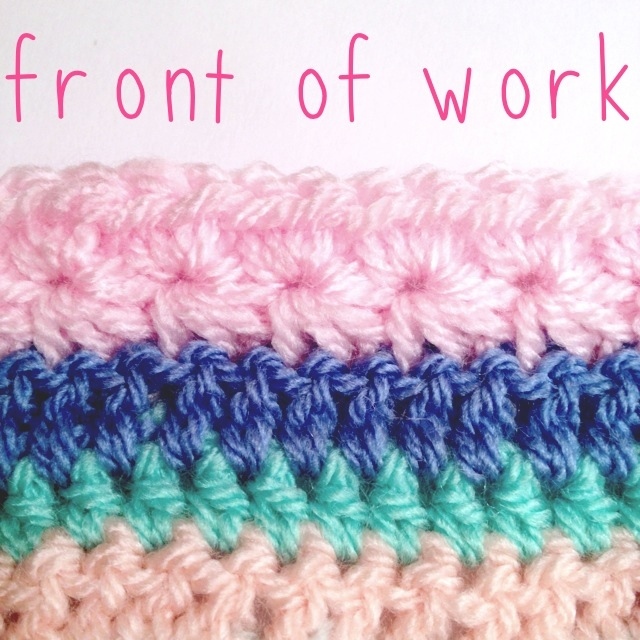 The bobbles will be a different color, so pick one that goes with your current working yarn. 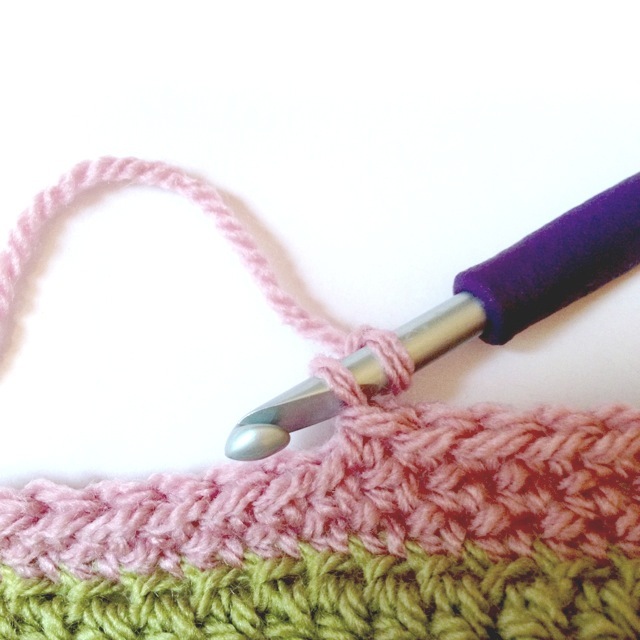 If you want to space your bobbles like mine, here’s what to do. Working over your bobble yarn, make 8 more hdcs, leaving the last unfinished. Repeat the bobble. Keep doing this until the end! 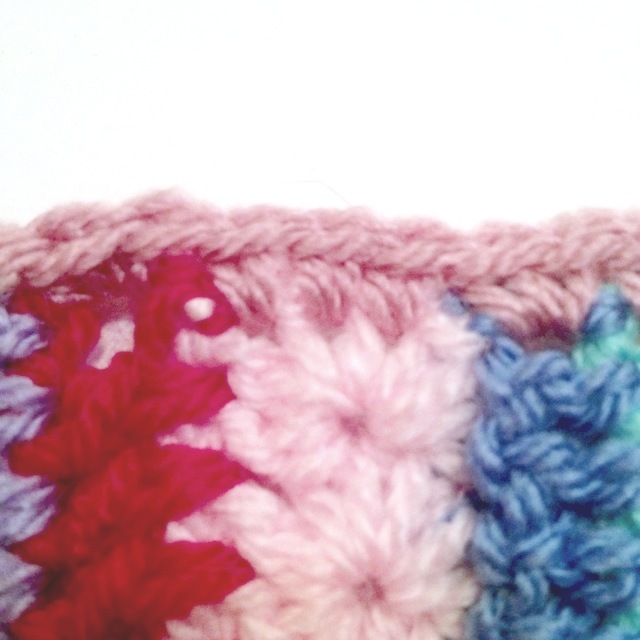 You will not have 9 stitches of background color at the end (I have 7) but that’s OK — it looks fine, right? With the same background color, dc across. That completes the bobble section! Aren’t they cute? 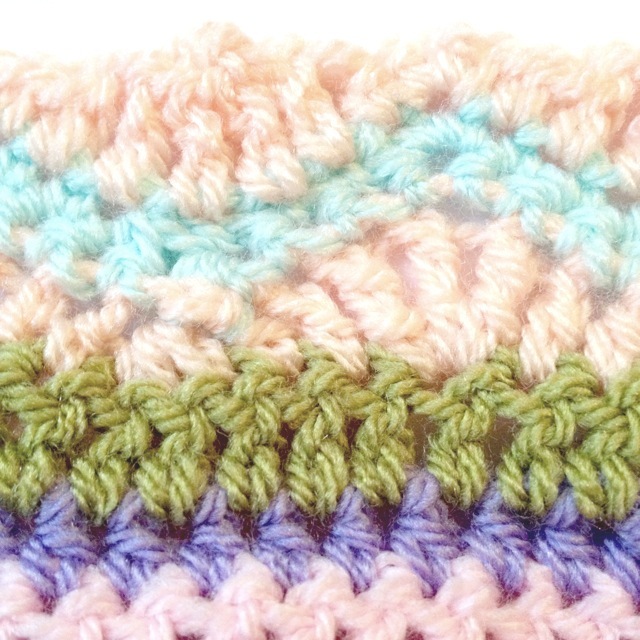 With new colors, work these three rows in the granny stripe pattern. With new color, hdc across. 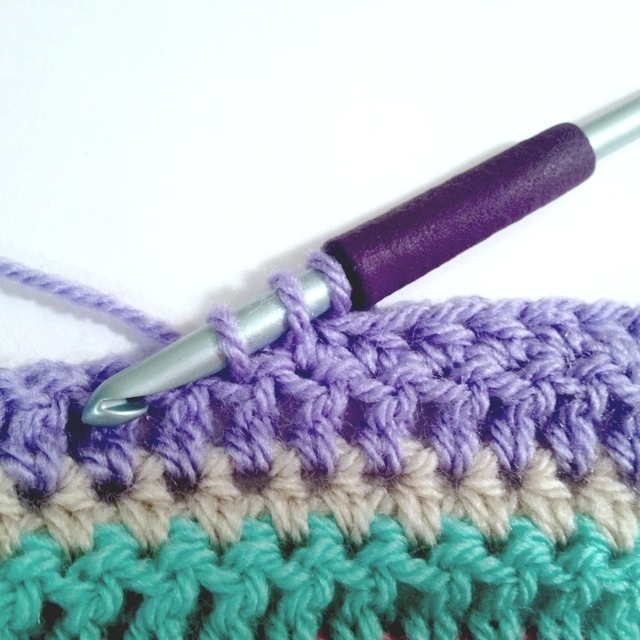 Remember to crochet between the stitches below like we did above the star stitch last time. Count your stitches at the end, just to be safe. 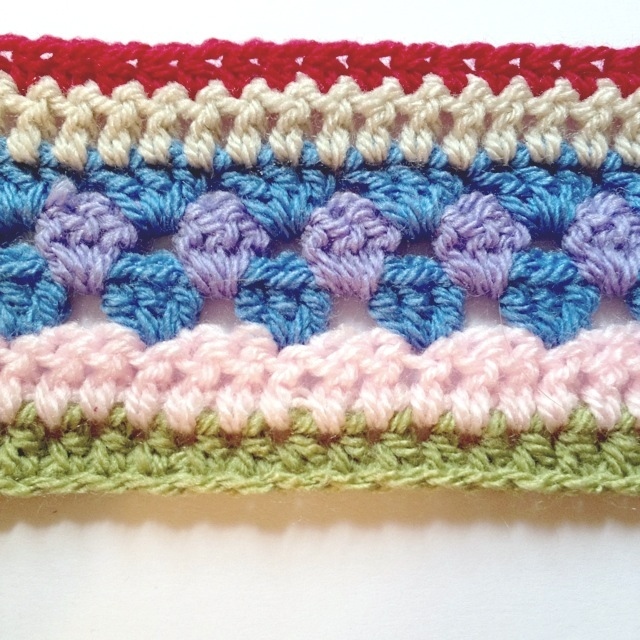 With 2 colors, do the Catharine wheel stitch pattern. 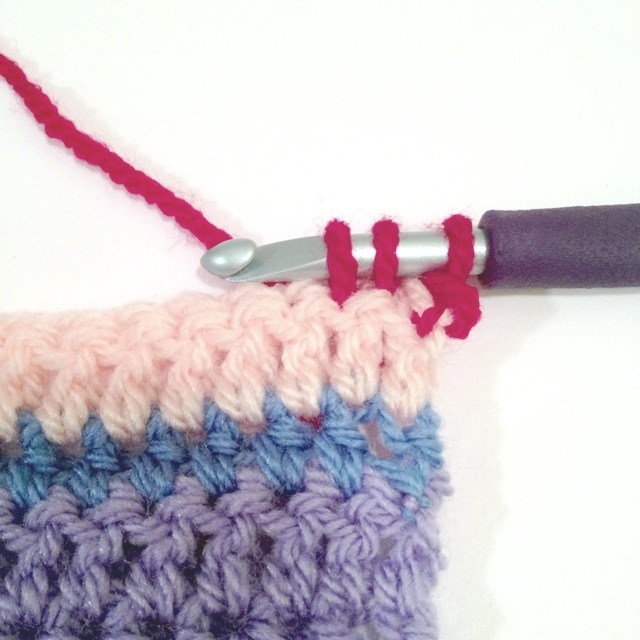 And don’t forget to keep your stitches very loose! Someone suggested going up a hook size or two for these rows, so you could try that if it’d make you more comfortable. With new color, dc across the same way we did after the last Catharine wheels. Count your stitches when you’re done. 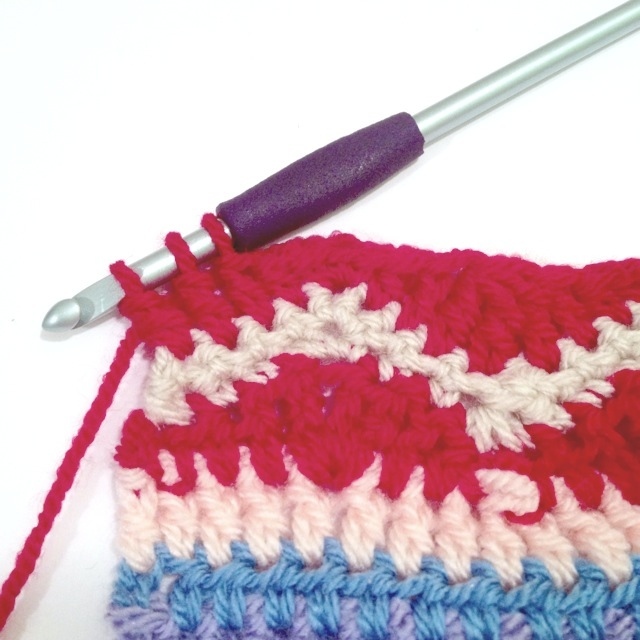 Using another color that you have a lot of, repeat the three rows of the bobble pattern. 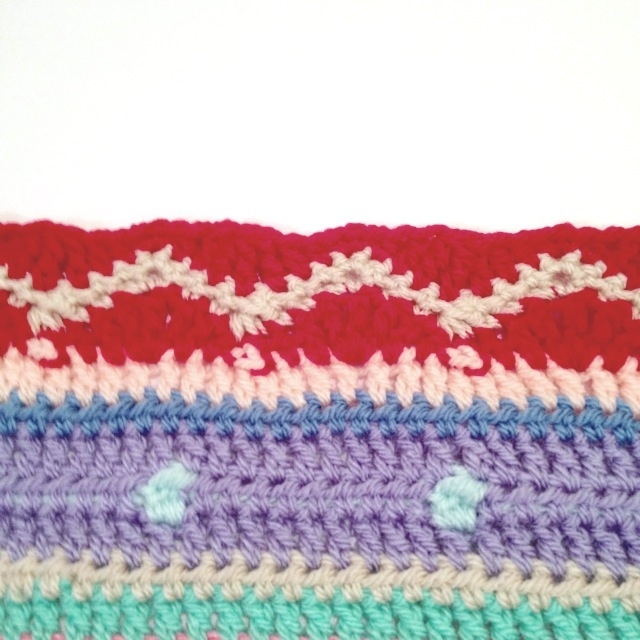 With new color, work the two rows that make up the star stitch pattern. With new color, work hdcs in the spaces between the hdcs of row 80. 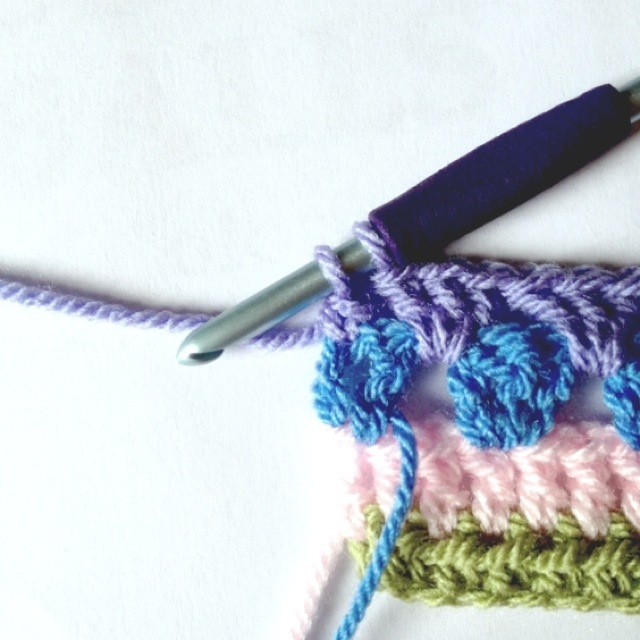 Check your stitch count at the end if you think you might be off one or two stitches. 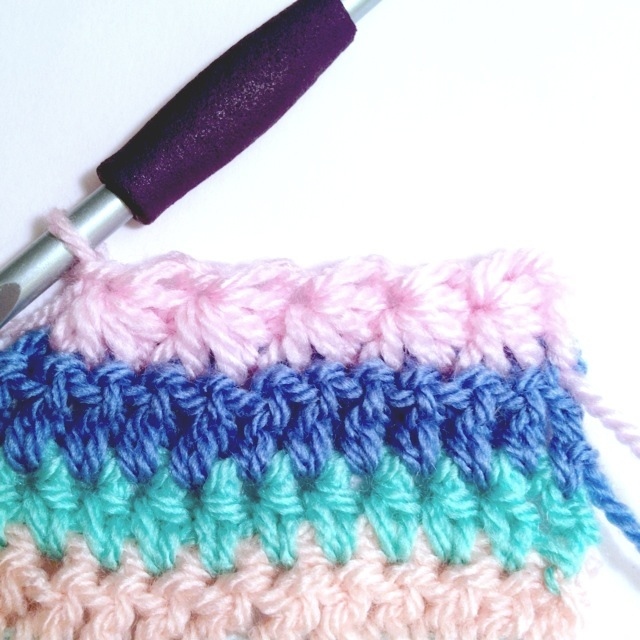 With new colors, work the granny stripe pattern. You get a bit of a spoiler if you can make out the top row. With new color, dc across as instructed in the original Catharine wheel instructions. You might want to count your stitches here, just to be safe. 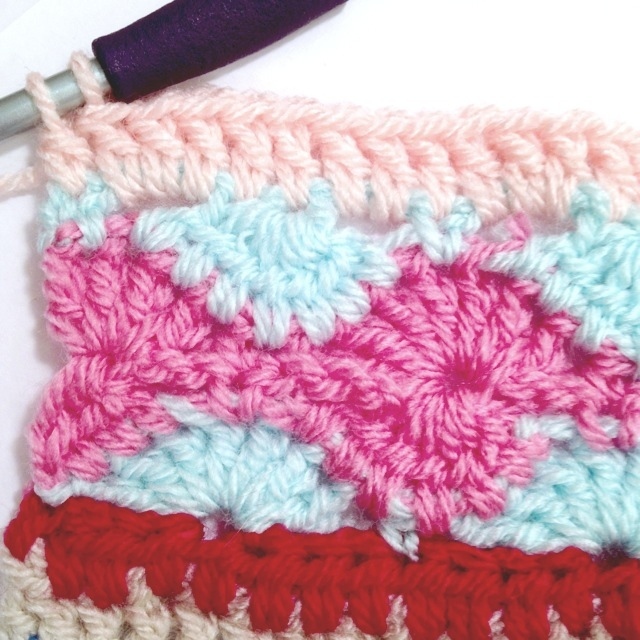 With new color, work the star stitch pattern. 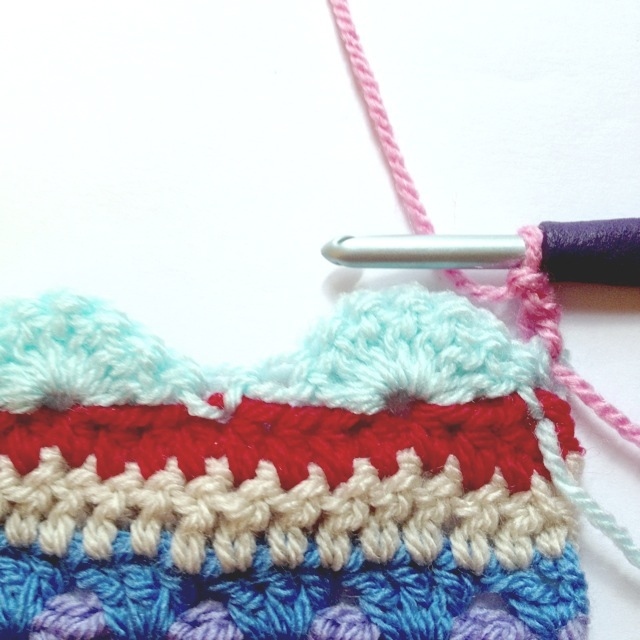 With 2 colors, repeat the bobble rows. With new color, hdc across. Fasten off (if you are done with your blanket) and weave in your ends! 1. Be conscious of your right and wrong sides as you continue. 2. 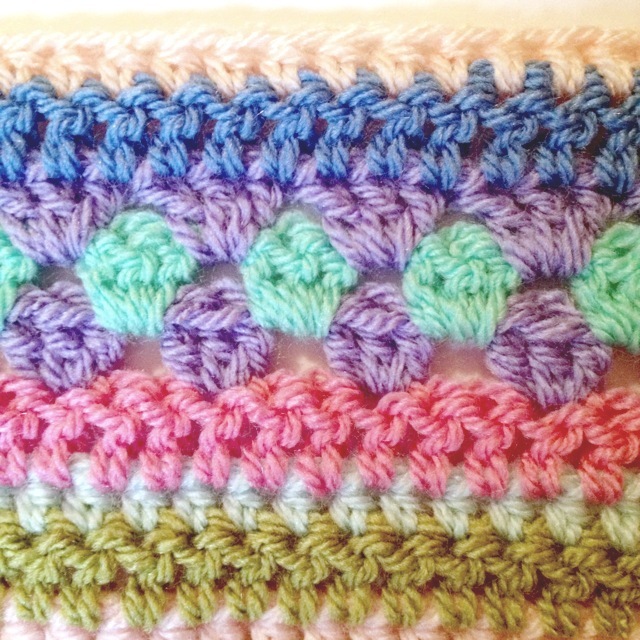 The way I chose the order of the stitch patterns was pretty random except for the bobble rows. 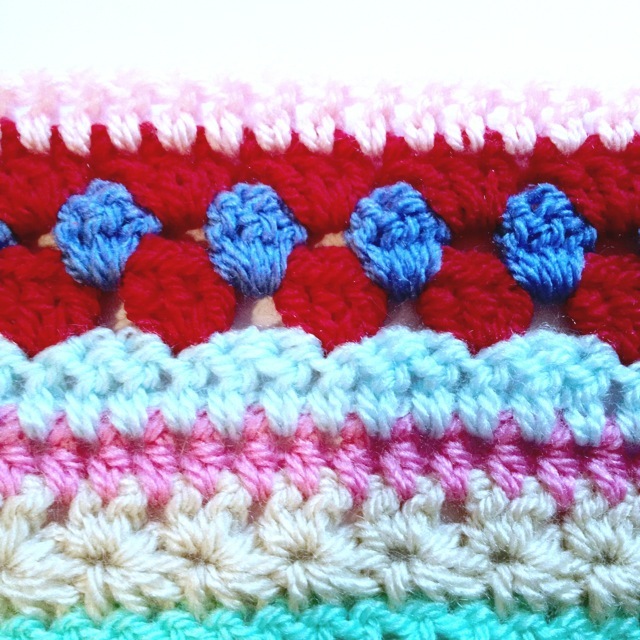 I tried to evenly space the bobble rows from each other, hoping that evenly spaced big bands of color would tie the whole thing together nicely. 3. 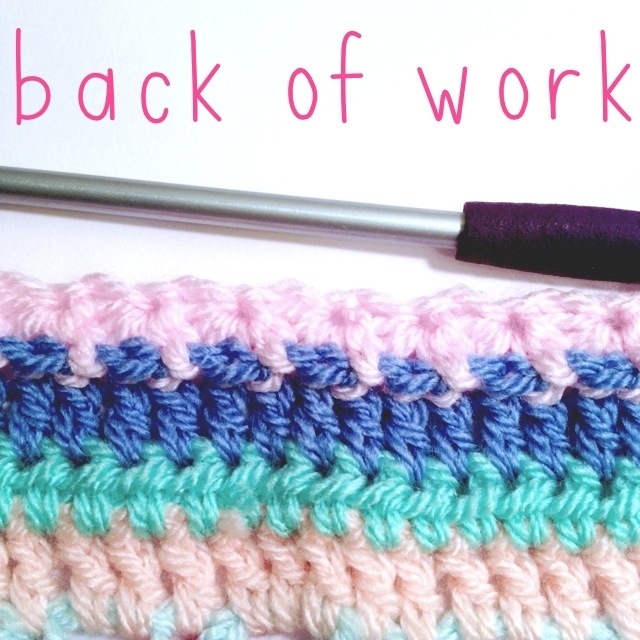 If you would like to follow a specific pattern, I’d recommend going back, working row 8, and continuing from there. That would be the first Catharine wheel row. 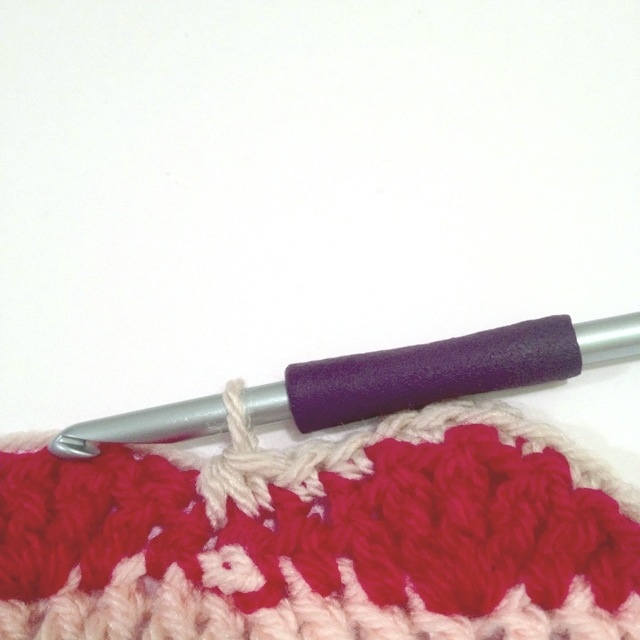 That should keep the bobble rows evenly spaced and will also keep your right and wrong sides correct. When you reach the beginning of your border, slip stitch to close the round, ch1, and begin row 2. 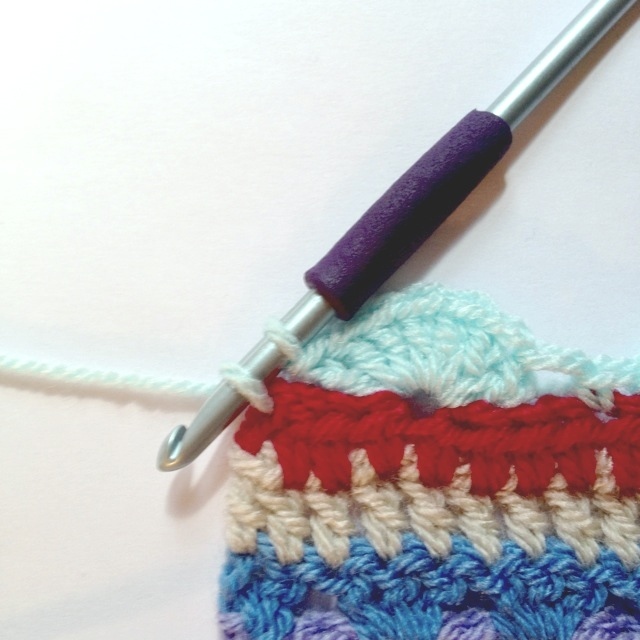 Work sc stitches into every stitch of your first border row, remembering to put in extra at the corners. Close the round and begin row 3 the same way. If the edges of your blanket are too uneven for your taste, feel free to wash and block your blanket according to your particular yarn label. I myself did not do this with my blanket. At this point my blanket is so large that I couldn’t get a good photo square on, but you can see all of the rows there. Let’s remember our inspiration! The lovely blanket that inspired me was made by Julie at Little Woolie, and I must say that I’m a bit embarrassed that my blanket came out so close to hers; despite some efforts I made at the beginning to make them different, they do look so alike, particularly at first glance. I’m much relieved to say that she is OK with it all, because I did have some pangs of guilt there at the end. However I’m very happy with my blanket and I really do mean this as a credit to Julie’s lovely work — she is an inspiration in many ways! If you wish to pin her picture on Pinterest, please go here and do it from her page so that she can get the credit that she deserves. I’ll appreciate it, and she will too! Beautiful! And I love your directions! Very well written and really helpful photo’s of the process. Thank you! Wow thank you! 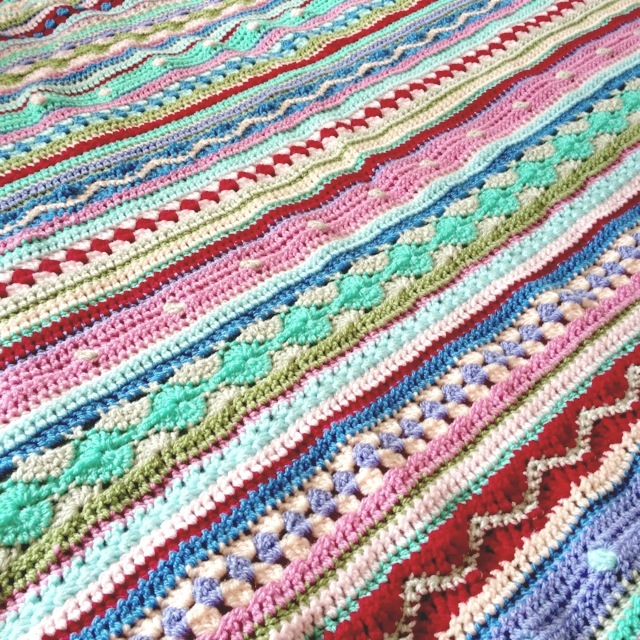 Having spent months and months beavering away at my own “little Woolie” inspired blanket, I’m so thrilled to have found your very clear tutorial.. As a beginner crochet’er I’ve made a lot of it up as I go along so I’m very glad to have something a bit more concrete to follow for the last 50 cm! Thank you so much for a wonderful pattern. 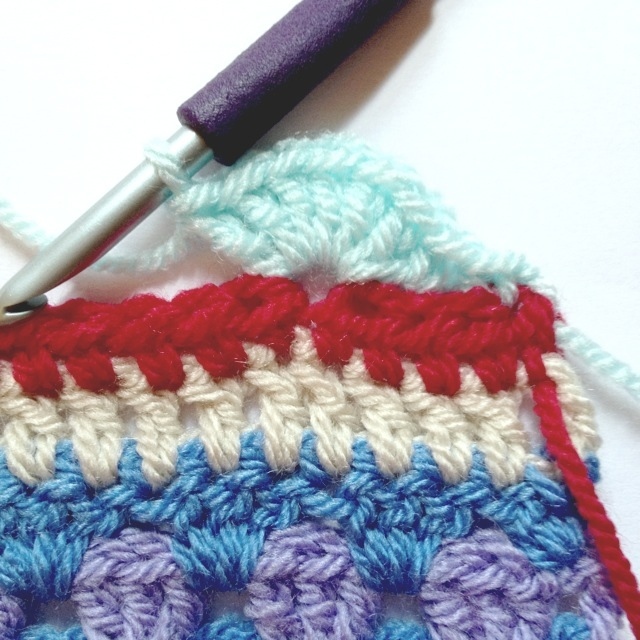 I had such fun choosing colours and seeing the stitch patterns and colours come together. I used Vinnis Nikkim 100% cotton in a double knit. 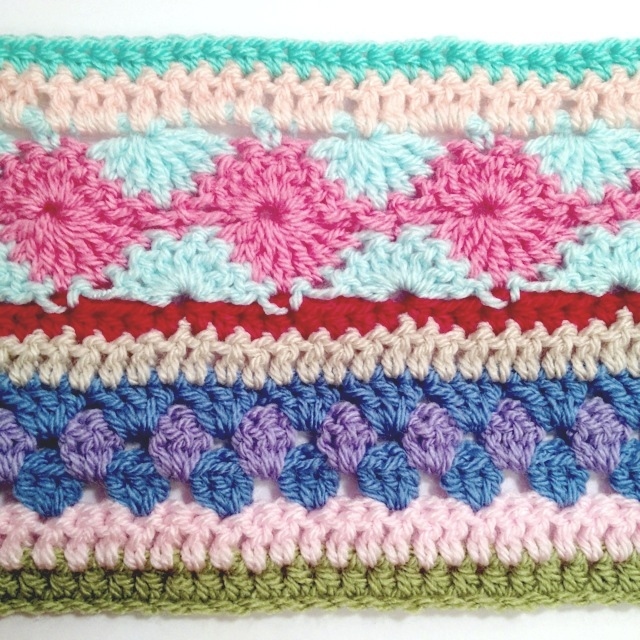 I worked a total of 200 rows by repeating the bands of stitches. I live in Port Elizabeth, South Africa. Thank you for posting this and your great explanation of all the stitches and pictures. You did a great job. I will definately be trying this. 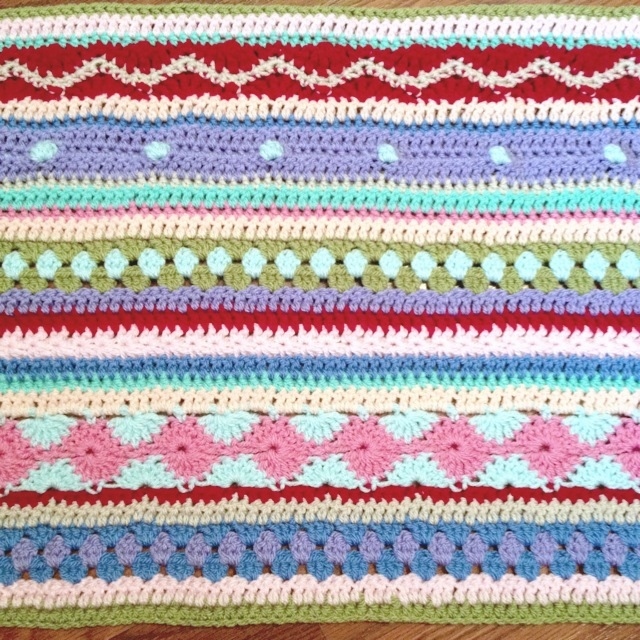 Hi Hannah, I love the blanket!, I was wondering how many yarn of each color did you use? I am going to buy the yarns. Thank you! Hannah, I just found this site and I love this blanket. I want to make one in the same colors you used. Could you please post the names of the colors. I would greatly appreciate it. I plan to check in on your site from time to time and use the patterns you post. You are wonderfully creative. Sure! I used Parchment, Meadow, Fondant, Sherbet, Aspen, Apricot, Candyfloss, Lavender, Aster, and Pale Rose for the border. I hope you enjoy it! Thank you for putting directions all on one page 🙂 I started my own stripey blanket before I found yours online so now I have more inspiration for my rows up to this point I’ve just been making mine up as I go but I like what you’ve done too. Just love this afghan; turned on to it by a friend at knit shop retreat last weekend. I would like to ask if there is any special rule to follow in regards to number of colors and choosing their sequence. It would seem that the sky is the limit but, I am a bit OCD when it comes to doing things the “best” way. Open to suggestions. hi, love your blog. do you happen to have the pit bull sweater and scarf instructions somewhere? I have to make that for my niece’s pit bull Millie! thanks so much! am going to do the afghan during winter break. will post a photo when its done. I’m afraid I don’t. I believe I just made them up but didn’t write them down. It was very trial and error — I kept having to try the sweater on her as I worked. The scarf was just a short and skinny scarf using dc stitches. I’m sorry I’m not of more help. I can’t wait to see your afghan though! These are directions even I can follow. Thank you! Any chance you have these directions without the pictures? I wanted to print them out and it 95 pages with the pictures, then I need to edit all the colons out (that you use when saying it looks like this, or whatever) and put periods in. It would be a lot easier to do the pattern for those of us who don’t need the pictures. I’m afraid I don’t — I don’t have any copy of the directions other than what’s on the site. I can certainly make a copy of the directions without the pictures but it would probably be a while. I just moved to another city and I have a lot going on, plus the giveaway I just started. If you’d like to wait, let me know and I will put it on my to-do list! try the cleanprint extension-it lets you remove pictures, comments, etc, so you get only what you want to get. It is an extension that gets added to your toolbar. I use it all the time, if I didn’t all my patterns, recipes, etc would be volumes long. You can also shrink the text to fit it on fewer pages. It tells you at the top how many pages it is so you can continue removing til you have what you need. Hmm… Well I can’t tell you how many stars you should have because I don’t know if your blanket is the same number of stitches wide as mine. However, as you continue on, I suggest using removable stitch markers. 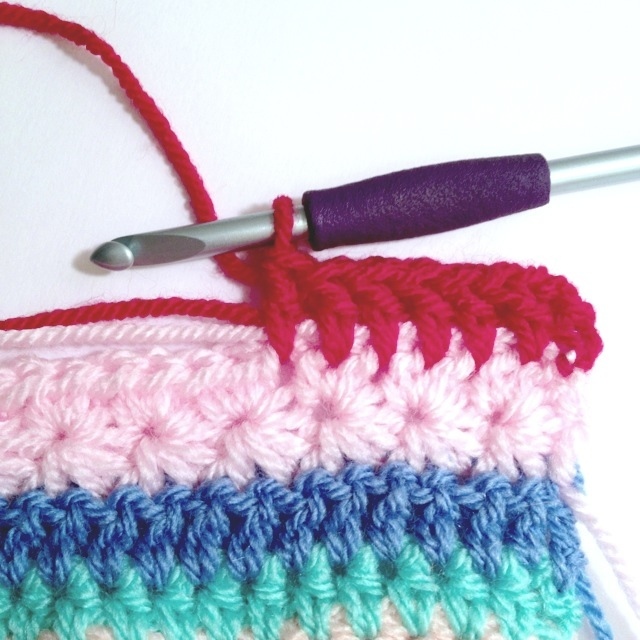 Try placing one every 20 stitches or so, and then you can more easily check your count. I’m not sure it will work with the Catharine wheels, and I know that the second row of granny stripe is not the same number of stitches (but it’s supposed to be that way). Hopefully that will help! I forgot about that, the size of the blanket being different than yours. Your instructions are fantastic, which make it all the more frustrating that I am still making mistakes. That Catherine’s Wheel was a bear. I pulled the whole thing out three times! I went and got some stitch markers, hopefully that will help from here. Thanks! Sure! The list of yarn is here (with photos): http://wp.me/p1DWME-AG And I ordered more yarn than I used — I used 10 full skeins of DK yarn (1 of each color; each skein was 295m and 100g) for the body of the blanket, and I used about half of a skein of a different color for the border of the blanket. It was cutting it close on a couple of colors, so I’d suggest that if you want to make a blanket bigger than a throw size, you might want to order two of each body color. Hope that helps! I’m glad you’re enjoying it so far! When you’re done we’d love to see pictures over on the facebook page, or you can e-mail me and I’ll put it up in the gallery of completed blankets from around the world! I’m glad you like it, and thank you very much for sharing it with your readers! Your post has some really gorgeous blankets! Looks like I’m 4 years behind in starting this. Im using 8 ply pure wool and 5.00 hook. Not sure if this is right but it seems to be coming together ok.
That’s great! I hope you share pictures when you’re finished! So looking forward to trying this. 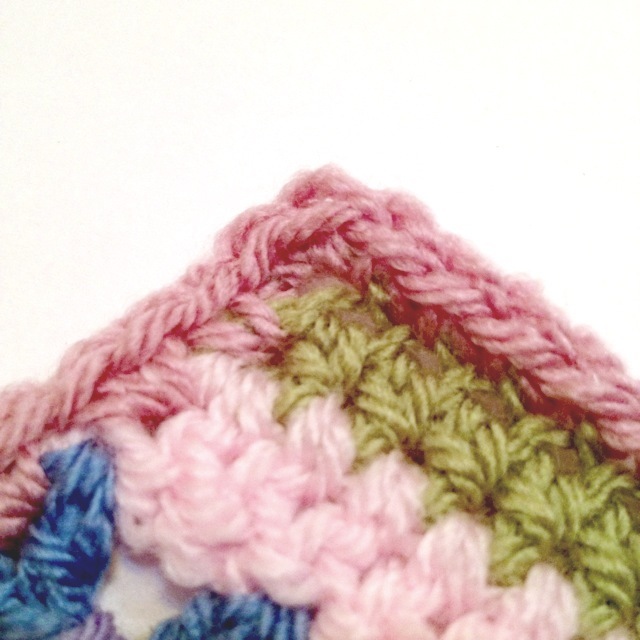 Have found you through instagram #crochetalong2014 ! I am @patchworkrainbow thank you for posting this whole pattern so concisely. Beautifull blanket!!! do you know if somebody translated this pattern into dutch??? I can read and understand what your are writing, a friend of my can’t. Actually, yes! 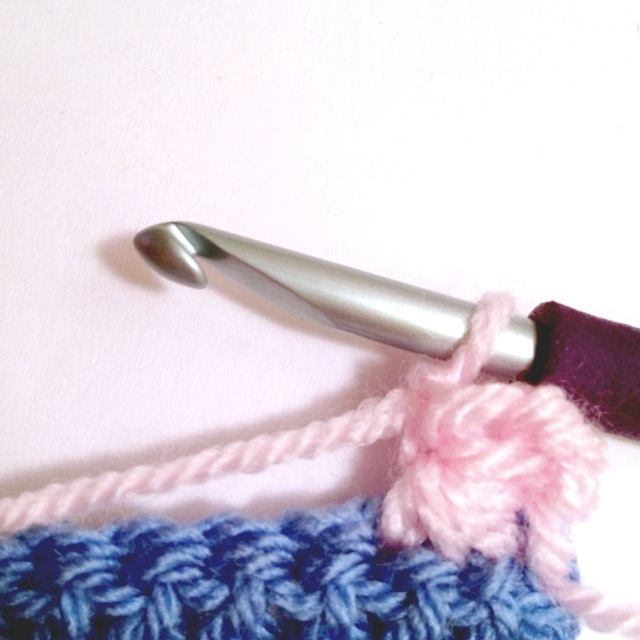 A large group of crocheters are currently following the Dutch version of this crochet along: http://terraysleven.blogspot.nl/ hope you enjoy! Thank you for this beautiful pattern. Do you know if there is a translated version in Dutch??? My friend wants to make this blanket to, but her English is not good. 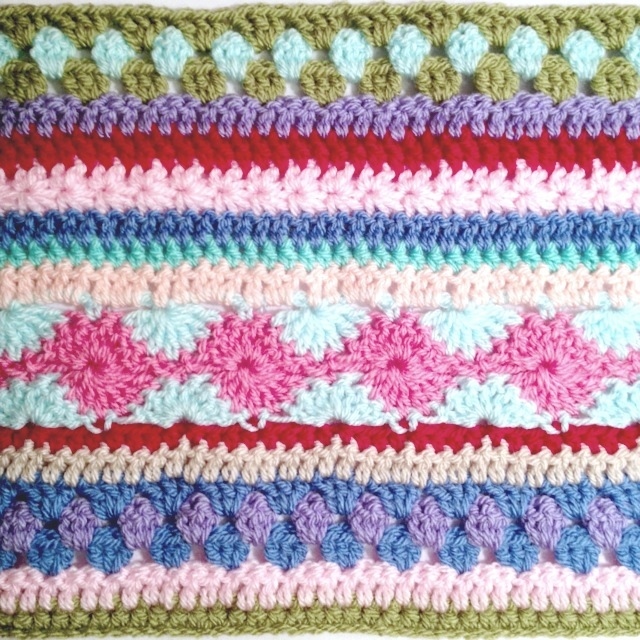 I love this blanket ,and I make this in the new pink colors. Is it possible to translate this free pattern in dutch, if you agree ,I want to give it for free on my crochet website , hakeninstijl.nl ( the site is not ready yet) i will translate it for you hooked in style. Thank you! You can if you like, but it is already being translated into Dutch here: http://terraysleven.blogspot.nl/ I don’t mind if there are two Dutch translations, so it’s up to you. You’re right! I’m so sorry — I forgot the shade called Lipstick! Thanks for pointing that out. It should be fixed in the pattern now. 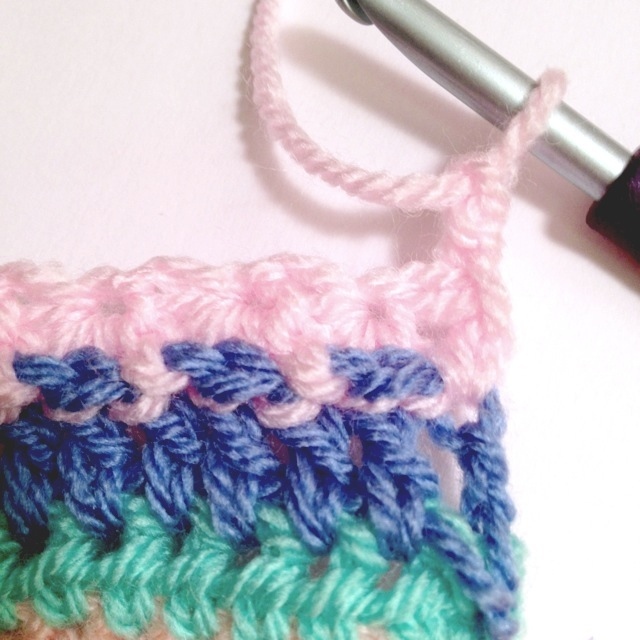 I would practice by making a plain square first and learning the basic stitches (chain, single crochet, half double crochet, and double crochet). After you get those down you should be good! Hello! I’m a crochet and loom knitting addict! Haha! Thank you so much!! 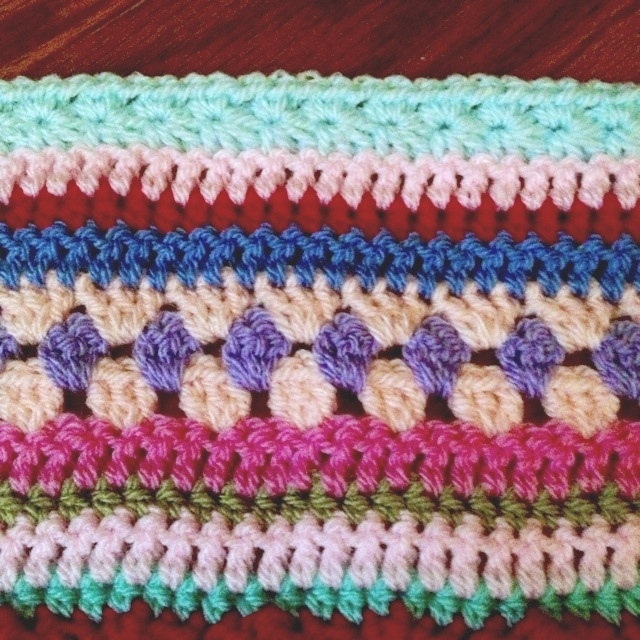 I have been looking for a pattern just like this in order to push my own boundaries to learn more crochet stitches! This is perfect! Again, Thank you! I hope you enjoy it! Feel free to post a picture on the Facebook page when you’re done — I’d love to see! I like this pattern but, I had chained 194, and followed the instructions. But by the end of row 3, I was short 1 stitch at the end. I don’t know where I messed up. I’m not sure without seeing it. The middle row of the granny stripe isn’t supposed to have the same number as the rest of the rows, but you’re talking about the first row of it so I’m not sure. I’d just add a stitch at the end of a row though instead of starting over. Mine’s about 50″ square, so it’s a throw size blanket. I hope you’re enjoying it! I’m enjoying it very much (sorry my english is not so good 😉 ) it’s really the most beautiful blanket I ever saw!!!! Thank you for your answer! Mine is about 50″ square. Hope that helps! Yes I used almost all of it! My blanket is about 50″ square. Hope that helps! Thank you very much! I hope you enjoy it and if you have any questions or comments feel free to let me know! Love this blanket! Am making it right now! 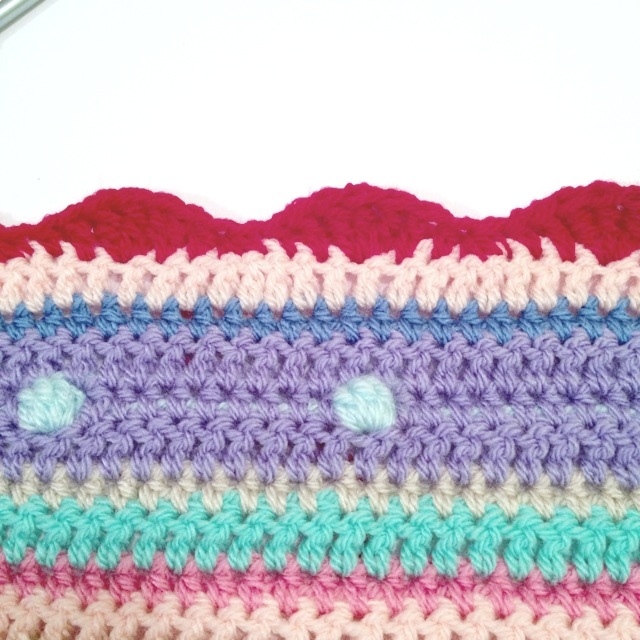 One little thing though: when doing the star stitch, you start talking about a front and back of the blanket (and I clearly see what you mean), however when continuing the pattern as described and doing the bobble row, I have my bobbles coming out in the back of the blanket. Did I miss something or is this normal? 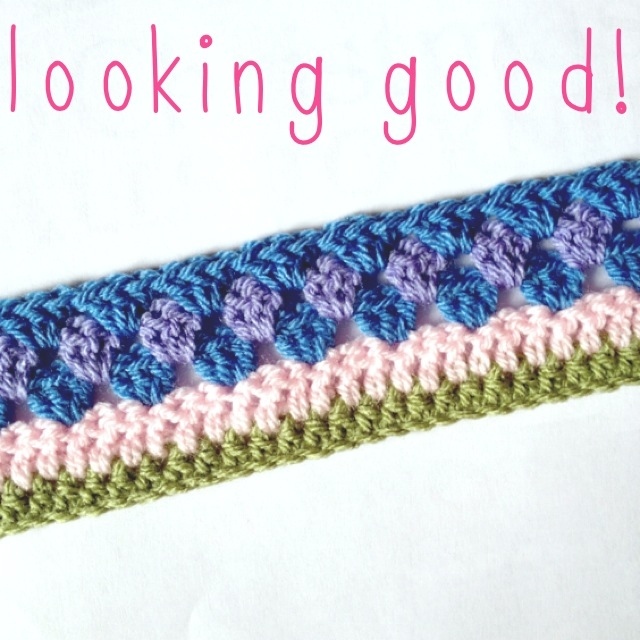 Thank you so much for kindly sharing this pattern, it’s so detailed and easy to follow! Am making a doll version 😉 to see if I could do it, and I can. Hi! I’ve just finished making as-we-go-stripey blanket. Thank you so much for the excellent instructions and the inspiration to make this blanket. 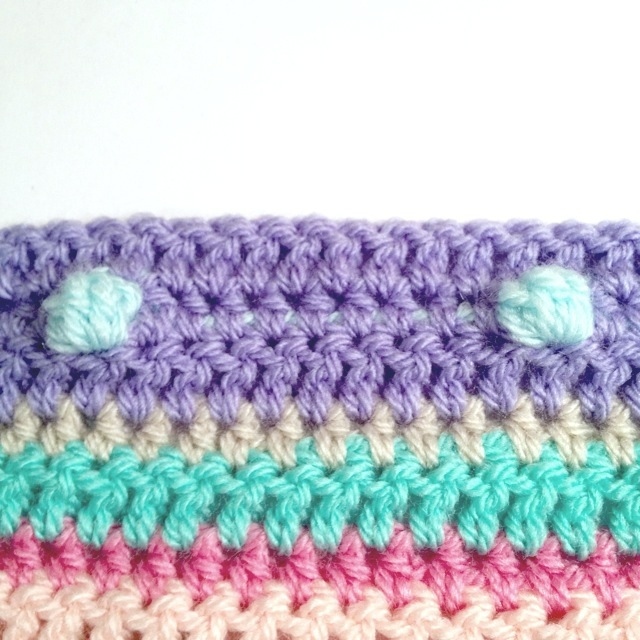 I love it so much I’m going to make another one and now that my crochet technique has improved – I’m going to be brave and mix it up a bit! I am having fun making this blanket for my soon to be born baby but have a question that I should have asked a while ago. When you say to do an hdc or dc but don’t tell us to chain at the end of the row are you expecting us to do one chain or none? I haven’t been chaining unless you tell us to & a couple rows looks a bit pulled tight at the end if that makes sense. Thanks for the lovely pattern! When it says to do a hdc row or dc row, you should chain for them. Sorry for the confusion! I’m really glad you’re enjoying it! Thanks! Hi, this pattern looks really great, I can’t wait to start, I was just wondering how big your finished blanket turned out? Sure! It’s a little over 50 inches wide and long (it’s square). Hope that helps! I was able to follow along, easy peasy. I don’t really understand how to read a pattern, but having the photos made it so much easier for me to understand. I wish all projects came this way, I made a baby blanket, 120 stitches across and only did up to row 70. It turned out beautiful. Thank you so much. I’m officially HALFWAY DONE with this blanket and I have had so many people ask if i planned to sell it I’ve actually started limiting who can see my progress pics on Facebook! You’re totally awesome for writing this pattern out! I’m using “crazy colors” (bright blues/greens/pinks/yellows/etc) because that’s what I like, and it’s turning out AMAZING 🙂 Thanks for the pattern! I’m glad you’re enjoying it so much and that everybody else loves it, too! It sounds really pretty with those colors! I finished it!!!! and sent you pictures! I had (as I called them) wonky edges, so I improvised my border… i used a round of sc, then a round of scallop/fans (think the first row of the Wheel pattern if you will) in an different color, then back to sc in the first border color… it might be cheating, but after working so hard i wasn’t about to let those edges look like it wasn’t intentional! and by gosh, they look like i meant to do that now! I’m glad it worked out for you! Thanks for sending the pictures, too — I love seeing them and I’ll put them up in the photo gallery soon! Mine actually did that a bit too, though I’m not sure why. I just poked them through to the proper side when it happened. Maybe I should have tried a different method of making them, but it was very spontaneous and I don’t think I even made a swatch. I hope it goes well! so wonderfull!!!! We will made this plaid as a “friendship plaid” :-). Can you tell me how long the plaid is? I don’t blame you for not wanting to rip it back out! I’d do a basic row for the first border row to even it out — you can do sc in the areas that are widest and hdc or dc or even tr in the places that pull in. Then once you do that you can add a more complicated border or whatever you like. Does that help? Thanks for the advice. The real problem is that because the sides change colors all the time I think it may still be noticeable but I’ll try and I’ll report back and let you know how it goes. 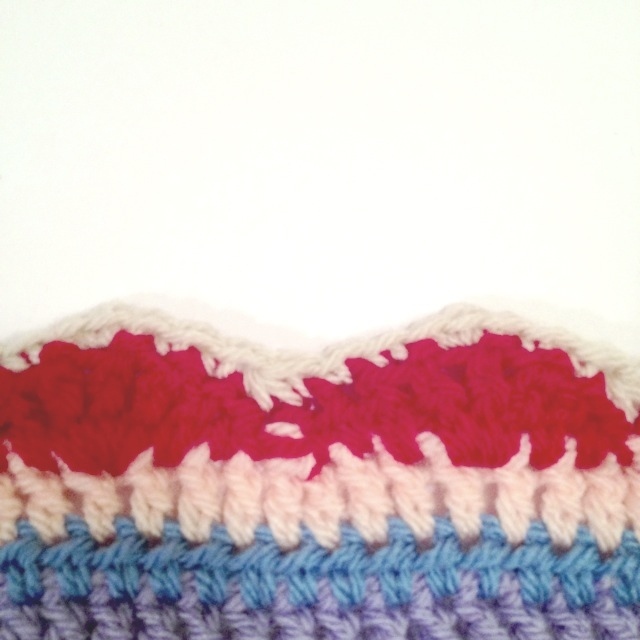 Due to me not counting each row of stitches, mine turned out a little more wavy on one end too. I thought about buying some blanket binding to sew all the way around this blanket so it would be nice and straight covering up those wavy ends. Since the yarn I used was all vintage I decided to just sc and hdc in the valleys, and I made two rows on each end of this blanket. I did not tuck the ends of the rows in. I just pulled them through the sc/hdc edging and added lots more fringe. It’s afghan size and I love how it turned out. A very very thank you for your detailed tutorial! I can’t imagine how much time and efforts you have put in for every detailed steps and pictures, but I know that with every stitch u have done, your thoughts are to share this pattern with everyone. Thank you so much! I am only a quarter through my throw and love the colors and different stitches. I do notice my edges are getting increasingly uneven and see that all the different stitches are causing this, especially the Catherine wheel! Even though I did it loosely it still pulled the row in and caused unevenness. I’m going to have to go around the whole edge a couple of times to make this look presentable, or maybe use some free form crochet to help it. It will be beautiful if I can straighten it. Just the pattern I was looking for! Thank you so much for all the work you put into this! I am (almost) speechless : this is wonderfulissimo !!!!! I’ve been searching through the web for quite a while now to fine a blanket original enough to give me kind of impulse to start. This is the one ! Discovered two days ago, I started the job yesterday. Your directions are extremely helpful and precise enough to understand it all. I thank you VERY much for this and for sure I definitely send you a picture when I am finished. Thank you so much for sharing! I am currently making one and having a little trouble with the star row. At the end of the first stripe of the star, do I close the “eye” before the hdc in the last stitch? Thanks in advance for your answer. thank you so much for this pattern! 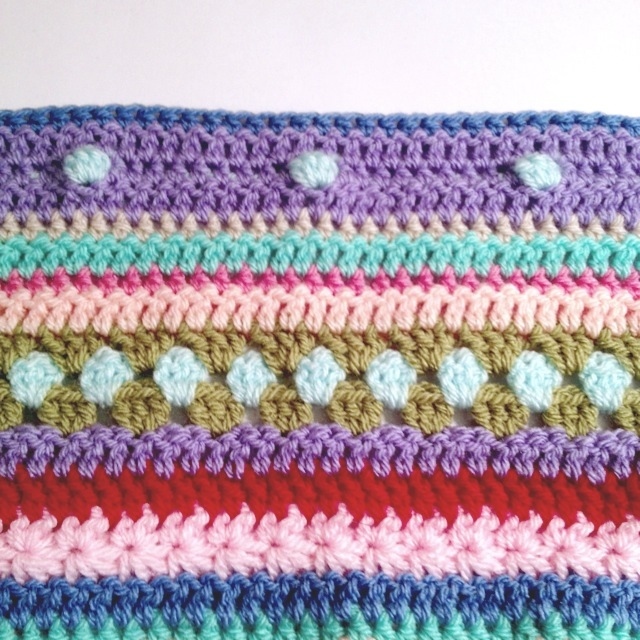 I saw the blanket on the internet on another blog I’m following quite a while ago but never realised there actually is a free pattern on another blog by someone who invented the pattern. I was only today I found your blog which is really lovely. And the pattern is even as a pdf so I can print it and read it easily on the train on my way to work (my most common crochet time)! Thank you so much. I finished a ripple blanket last autumn and had only little projects to use up the rests ever since, so now I was searching for a new project and tadaa, here it is thanks to you. I’ll send you a photo once I’m finished (although this might take a while). I’m glad you like it, and I look forward to seeing your finished blanket! I hope you enjoy making it! 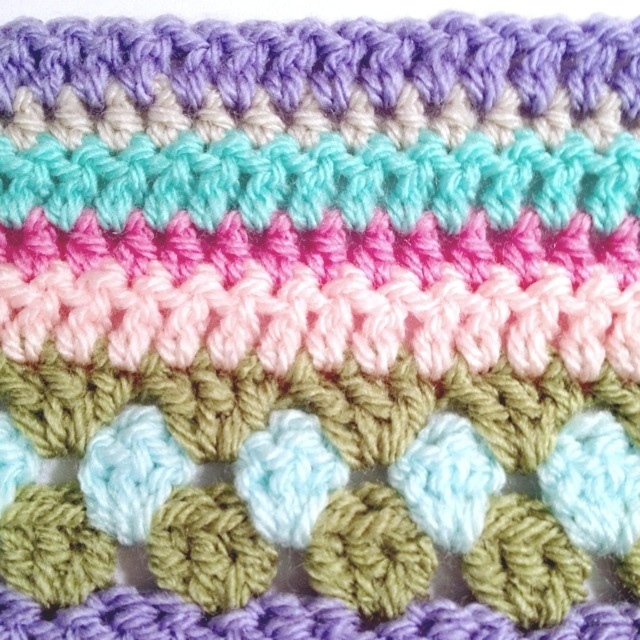 I’ve loved crocheting the blanket from this pattern. Thank you for sharing it. I still have the border to add but am happy with the 172 rows I have completed. Your picture instructions are wonderfully clear and a great help. I especially love the look of the Catherine wheel pattern although I am concerned some of the single threads in this part may snap with use. Can someone tell me if the 9 balls of yarn under materials means 9 balls of each color? Because there are actually 10 colors? TIA for your prompt reply. You only need 1 ball of each color for a throw size, but 2 if you want to make a larger blanket that would fit a bed. Hope that helps! I’m having so much fun with this pattern!! Look forward to getting home from work to work on it!! Thank you for sharing this… Will post photos when I am done and just posted day 1 on Facebook!! That’s a truly beautiful blanket. Love the colours you’ve chosen and so much work in the instructions – thank you so much. I’ve got a blanket-on-the-go along the same lines but much smaller – lap size for chilly toes on winter evenings! With any luck I might finish it sometime this year – no rush! Well done – it’s a work of art – and thank you for popping over to my blog! Always welcome for a chat! Thank you so much for sharing and all of the great direction and photos. Two months ago I started with the CAL blanket from the dutch group, but I swited to your side as your pictures ar mor step by step. I am not good at crochet. Normally I sew clothes but I cannot concentrate now due to operations and so I started with this project. I am only at the first wheel and it cost me a lot of sweat and tears. Maybe you never see a whole blanket from me but you inspired me to the first steps thank you very much. There is a large discrepancy on the edges of my blanket even after using a larger hook for the required stitches. I hope that the edging and blocking will help this. I am on row 40ish. I am using the same brand of yarn but obviously in different colors. Yes washing and blocking should help a lot! It did for me. 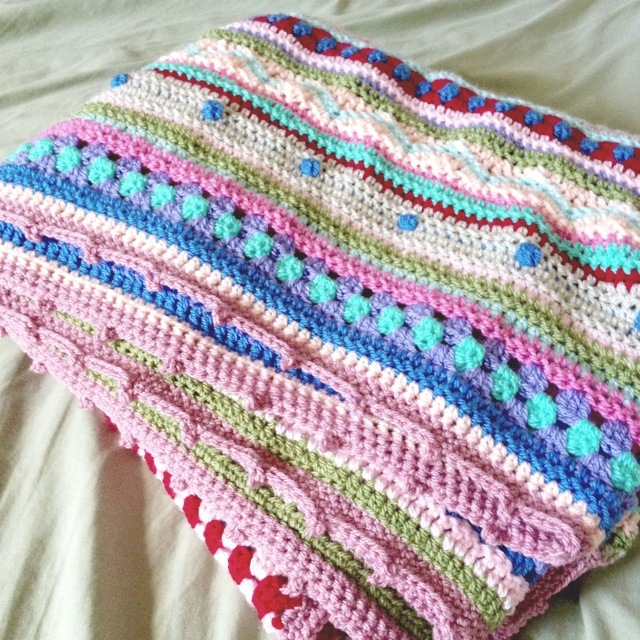 I love this blanket; I’m making it in a crib blanket size. I’ve gotten through the first sequence of stitches and have somehow added on about 10 more stitches than I began with. 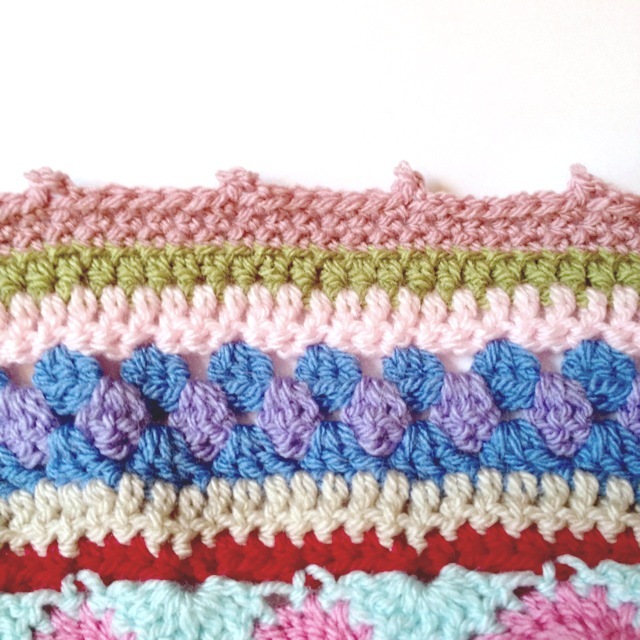 Here’s my question: should all the rows have the same number of stitches you began with? You said that the second row of the granny stripes shouldn’t, but what about the others? I don’t feel like ripping. I may just sneak in some decreases in a plain row and count from then on, blocking when I’m finished to even it all out. Thanks. Most of the rows should indeed have the same number of stitches. The first row of the star stitch pattern will not, and I don’t think the Catherine wheels will, either. Hope that helps! Hmm… I think I know what it might be. 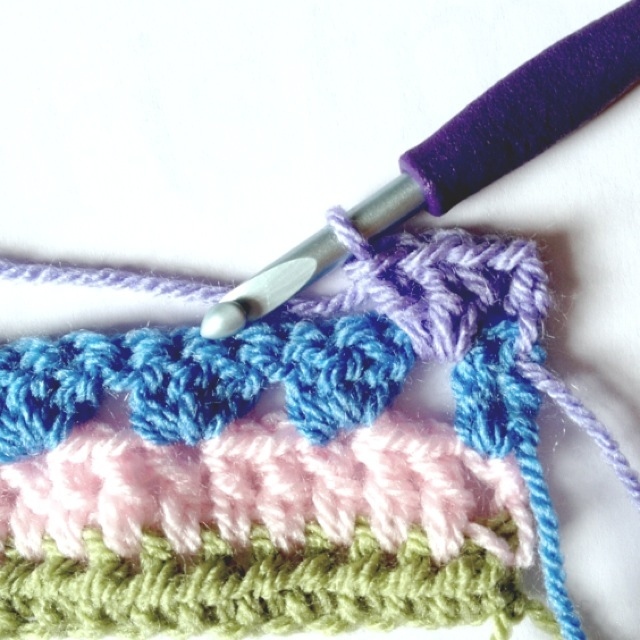 Go ahead and put another star stitch at the end to take up those last 2 sts. What I meant was that you should put a hdc where the last spoke of that additional star stitch is, does that make sense? Sorry for the confusion — I hope that helped! Let me know if you have any more questions! Dear Hannah, Thank you so much for this pattern. 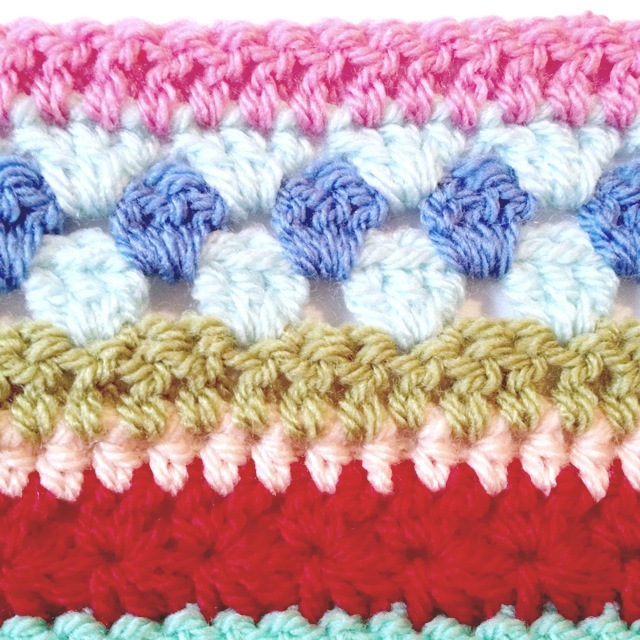 I am a novice crocheter but the colors and variety drew me in- I think this is a PERFECT project for newbies. 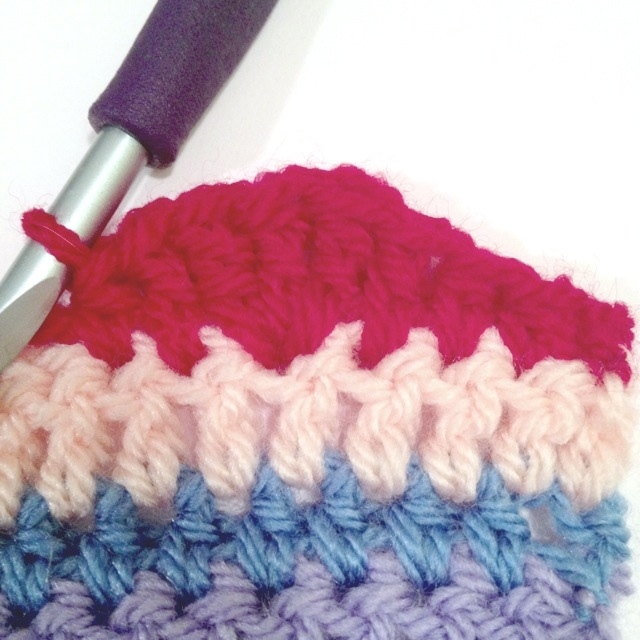 There are so many different stitches and I get to “practice” them two-three times throughout the pattern- I have already noticed a HUGE improvement in my crocheting skills from the beginning of the project to R84 (which I am on now). 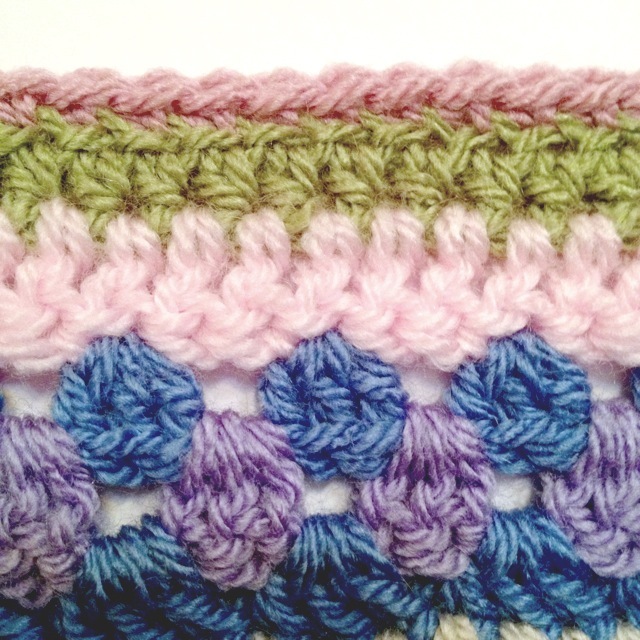 Before doing this blanket, I would have never tried a pattern that featured the “fancy” stitches (star stitch, bobble stitch, etc)- Previously, I had limited myself to single or double crochet or granny-style patterns. After I complete this blanket, I don’t believe I will have a fear of ANY stitch!! Thank you! Thank you! Thank you! P.S. I totally plan to do a second As-We-Go Blanket now that I have the hang of it!! I’m so glad it’s helpful for you and that you’re enjoying it! Thanks for such a nice comment! I am really enjoying making your blanket but I’ve got a bit stuck. Please could you explain row 33? You say ‘repeat row 32’ but what to I do at the top of thepeak? On row 32 you work 3 stitches into the one treble so on row 33 do you work into each of those stitches? Doesn’t that mean you end up with too many stitches? I’m glad you’re enjoying it so far! I’m sorry for the confusion — on row 33 you should put your cluster of 3 stitches into the center stitch of the 3 stitches below. Does that make sense? Since you’ll also be decreasing as you did in row 32 your stitch count will remain the same. I hope that helps — if you have any more questions feel free to ask! Hello! I am having a bit of trouble with the border. 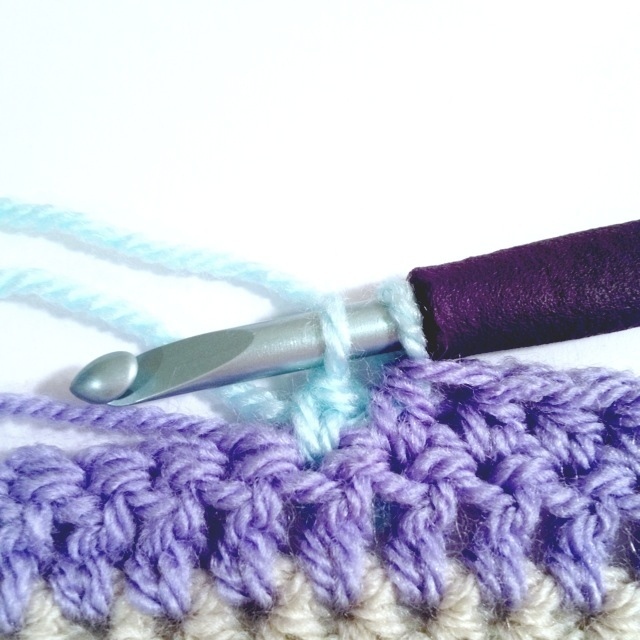 I commented earlier about how helpful the tutorial has been- especially with me being a fairly new crocheter. However, because I am a novice, many of the beginning stitches of each row are unsteady, messy, etc; therefore, I am having trouble with the border. Is there a tutorial that can help me with this? Is there a simpler way to do the border? I began the sc row but it was still looking wonky so I took that out. Should I continue, do the second row of sc then see how it is shaping up? Should I block it first, then work on the border? Help!! 😉 Thanks so much. To make it easier on yourself I’d block it first. That should help. Also, once you get the second row of the border done it really helps stabilize everything. If you have any more questions let me know! Hope that helps! 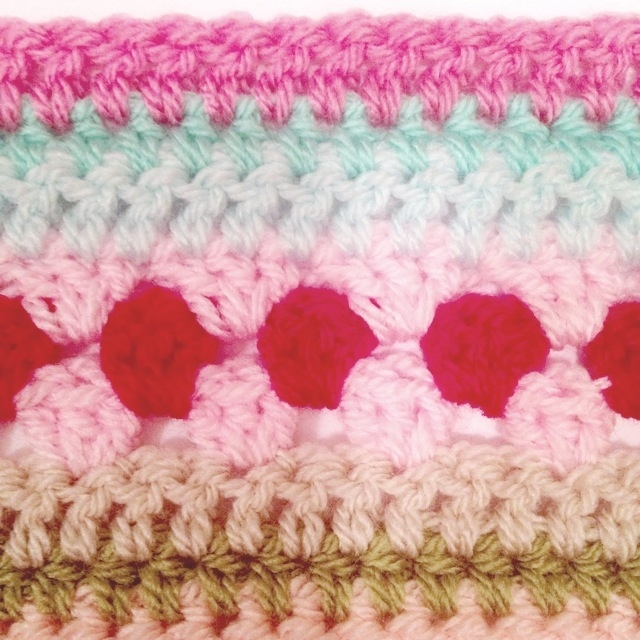 I’m a total beginner to crochet but I already up to row 70 of this pattern. thank you so much for sharing it and for the great easy to follow steps. I couldn’t have done this without you. OMG I love crochet! I’m so glad you’re enjoying it! 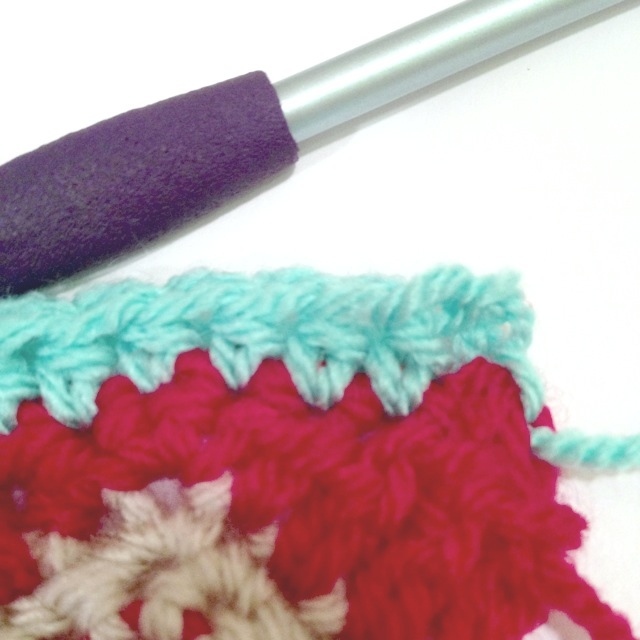 Crochet is great! Thank you so much for this beautiful tutorial! I am super excited to work on my blanket. I have one question…I am buying one ball of each color for a small blanket. Do I need to save one of the balls for the edging or did you use that color in your stripes also? I have 100gm of each color in DK weight and am going to make a stroller blanket. Thanks so much. I saved one skein/color especially for the border. Hope you enjoy making your blanket, and Happy Holidays! Wou, thank you so much for the pattern, picture with a clear instruction. The blanket is beautiful. I absolutely love this pattern! Thank you so much for putting it all together so clearly. My question is how did you decide the color rotation? They seem to flow so nicely. no color is to close together. I know I will spend hours overthinking this. Or I will end up doing the colors in the same order over and over. I can’t wait to start 2015 with this new project! I love this pattern. Thank you for sharing. I’m getting ready to do my mood blanket and doing these stitches. I’m glad you like it! I bet your mood blanket will be awesome! I’m glad you enjoyed it! I’d love to see your blanket, feel free to email them to me at the email address provided on the pattern page or you can post them on the facebook page and show it to everyone! Hello! 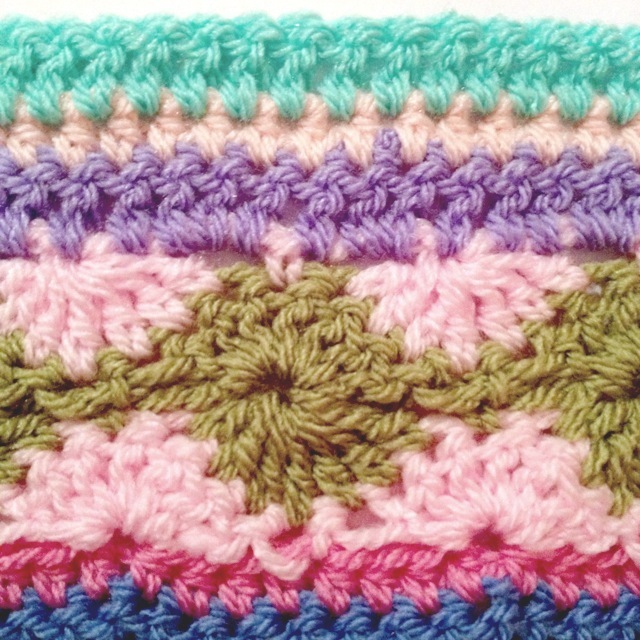 I’m now making my 2nd stripey blanket with this pattern — what a beautiful blanket! I’ve loved the first one so much. Okay, so here’s my observation: I did the chain foundation just as you did: 192 + 2 = 193 total stitches. When I got to the end of row #12, I looked carefully at how you did the end of that row (the row just above the Cath Wheel, where you have to count your stitches again so carefully. When I copied exactly how you did the end of the row (mirroring your stitch pattern), I ended up with 194 stitches, so I had to reduce by one, removing one of the clump of 3 stitches just before the final DC that sits on the end. Not sure exactly why it turned out that way, but thought I’d let you know. I’m enjoying my 2nd foray into this fun pattern! Hmm… I’m not sure why that would be. Thanks for letting me know — I’ll look back and see if anyone else has had the same problem. I hope you’re enjoying your second blanket! What a truly fantastic blanket! Super detailed blog instructions, great photo’s too! Thanks for sharing…. I am now going to sort thru my yarn collection to see if I have enough to make a start, good excuse to buy more if I plan to make a biggie! Best wishes, many thanks for your inspiration. Thank you, I hope you enjoy making your blanket! 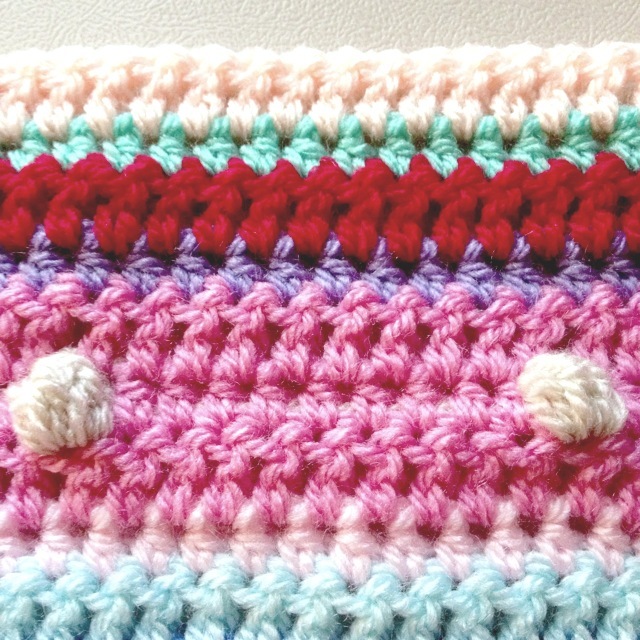 I love how this blanket looks…have ordered some yarns and can’t wait to embark on this new project!!! Thanks, I hope you enjoy making it! FABULOUS! Thank you for being so detailed. One of my next projects, so glad to have someone like you online to help. Thank you for taking the time to share! I’m glad you like it, and I hope you enjoy making it! thank you so much for the great pictures and the clear pattern description!!!! 6 weeks work but Wow the result!!!!! I will attempt this project and will let yoy know how it goes. Thank you so much! Sorry about the spellings. Meant “all” not asking. Meant you and not yoy. I’m glad you like it so much! I hope you enjoy working on it! Hi Hannah, my son wanted a bed spread and saw your blanket online, send me the link. I started 2 months ago finished last week, I don’t think I enjoyed working on a project this much ever, looks amazing and I am delighted with it, THANK YOU, such good instructions, found it easy to follow, after finishing all different rows I just did what I chose to do.Thank you again. Great pattern and gorgeous afghan! I’m making one for my new little one due in July. I didn’t get time to read through all the comments, so I hope I’m not asking a duplicate question, but I’m having trouble with the star stitch rows pulling in, no matter how loosely I try to do them. Would it make sense to go up a hook size on those rows, as well? Or am I doing them wrong? I’d say go ahead and try going up a hook size. 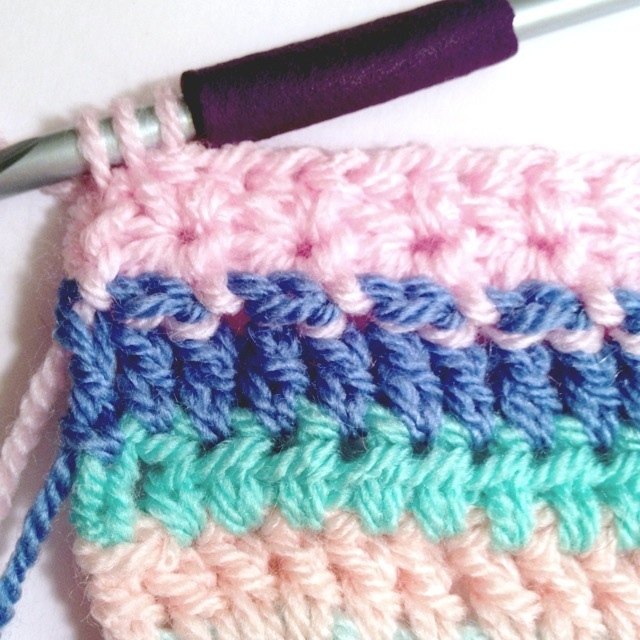 If your stitch count is correct after the second row you’re doing them right! Great directions for a gorgeous afghan, thank you so much! I’m making one for my new little one due in July, and my stepson is so jealous and wants one just like it. 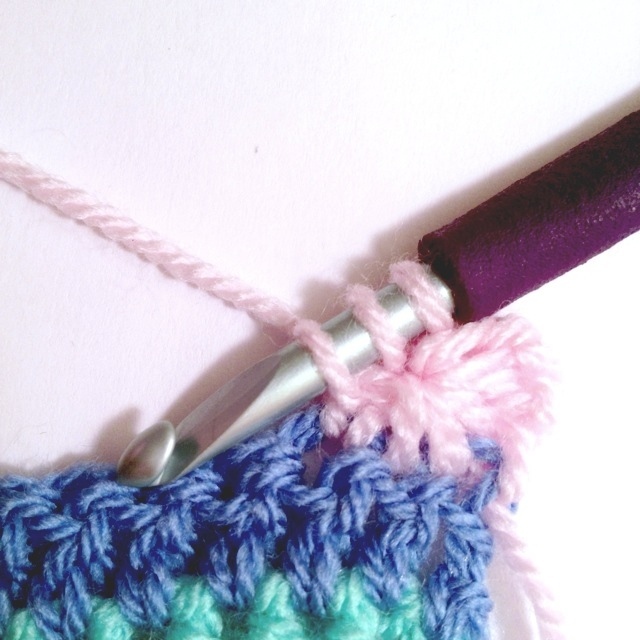 🙂 One issue I’m having though… My star stitch rows are pulling in, no matter how I try to loosen them up. Is it a good idea to go up a hook size on these rows, too, or am I doing something wrong? I have literally spent hours and hours on Pinterest trying to find something to make and I’m super excited to start this as a birthday present to myself this year! 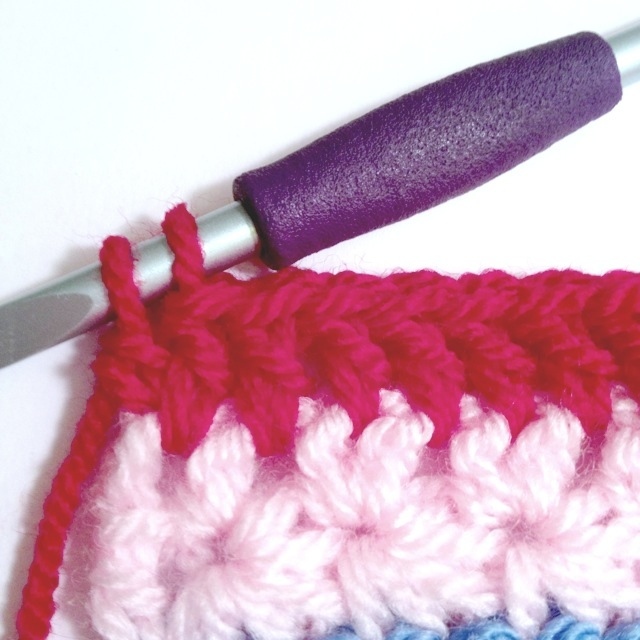 I saw that the estimated width was 50″ and I know everyone crochets with different tension, but I was just wondering how long your ended up being. (Not sure if you’ve answered it somewhere else so sorry if this is a repeat question.) Thanks!! Mine actually stretched a good bit with regular rough use, so now mine’s close to 60″! I’m glad you’re enjoying it and I look forward to seeing the finished product! Is there just a typed version of this beautiful work? I’d like to print it off, but 125+ pages is too much. I don’t crochet well reading my phone and crocheting. I can print off a less printer intensive pattern. Thank you for creating the pattern and sharing it. Yes, there’s a PDF version without pictures, the link is in that first paragraph. Hope you enjoy! I just found you. What a wonderful blanket. Could you please tell me how many chains I would need to make this into a king size bedspread? Thank-you in advance. I’m honestly not sure, you’ll have to experiment because it depends on your yarn, your hook size, and your tension. You’ll have to test it out by laying it across the bed, but as long as it’s a multiple of 24 plus 2 at the end, you should be good. Keep in mind the finished product will stretch a bit, as well. Hope that helps — sorry I couldn’t give you a specific number! 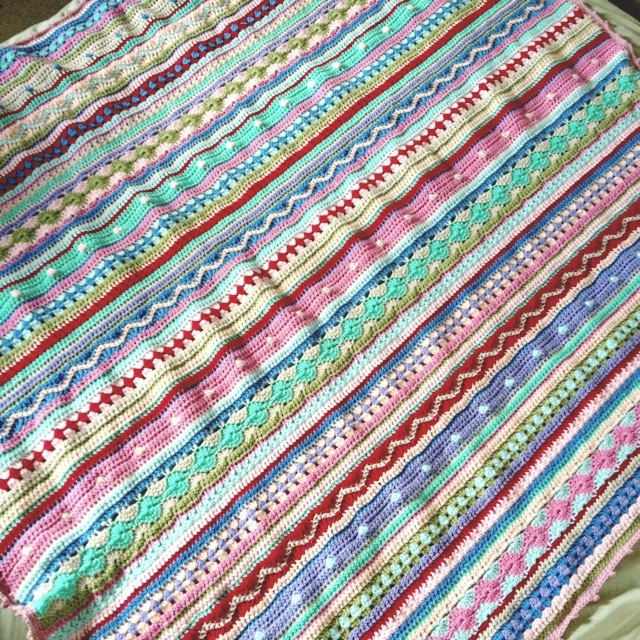 Beautiful blanket…….love it. thank you for sharing. Thank you for this pattern, I’ve been looking for a stripy pattern but found they were made of mostly simple stitches. I find it funny I just finished learning the Catherine and star stitch. I think I’ll need a larger hook to do those 2 rows. Thanks again, I can’t wait to put it on my list of blankets! I’m glad you like it! I’d love to see when you’ve finished! I would love to know how the stylecraft yarn holds up? I have never used it before. I would love to make this blAnket, but I don’t want to spend a fortune on yarn (at the same time I don’t want it to pill either). Sure! I’ve had mine for a couple of years and it’s been heavily used by people and pets. The strength is still fine. It’s stretched some. It has pilled some and gotten a little fuzzy in places but not anything unreasonable considering the heavy use. Hope that helps! Mine is in Stylecraft Special DK. It gets a lot of use- including my pup. I’ve washed it several times and it has held up very well. Good luck! Oh no I’m sorry Carmen! 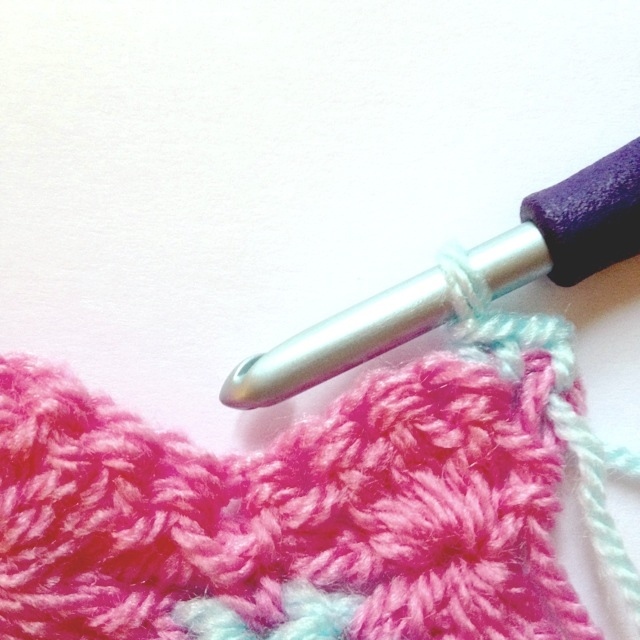 Some of the stitches can be tricky if you’re not used to doing them. If you ever try again feel free to contact me with pictures of problems or questions! This blanket is absolutely fantastic – love it. 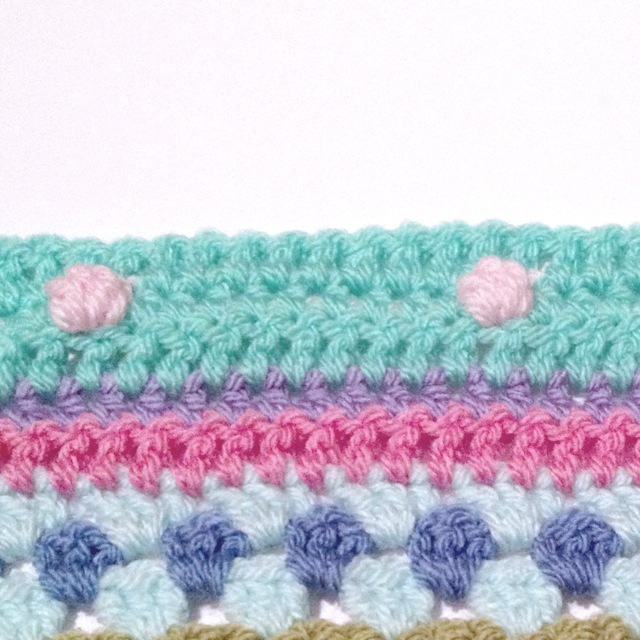 I was just interested in the bobbles when I came to the page, but I saw such a lovely blanket to make. I purchased one ball of a lot of colours and more than one shade of each. I really intended them for a granny stitch blanket/afghan, I’m seriously considering this one. I would even work out the entire length of this blanket (length ways and then work the second half as two pcs joined to the back) and I could have it over me to watch the tv or crocheting and wear it to answer the front dooror make tea. I didn’t look at your exact measurements, but I can work it out. This is well worth the find. Thank you so much for writing THE greatest directions ever! I am almost done with my blanket. I just have to get the border on. I will send a picture as soon as I can. I am so happy with how it turned out! Thank you I’m so glad you’ve enjoyed it! Can’t wait to see! I love your pattern. 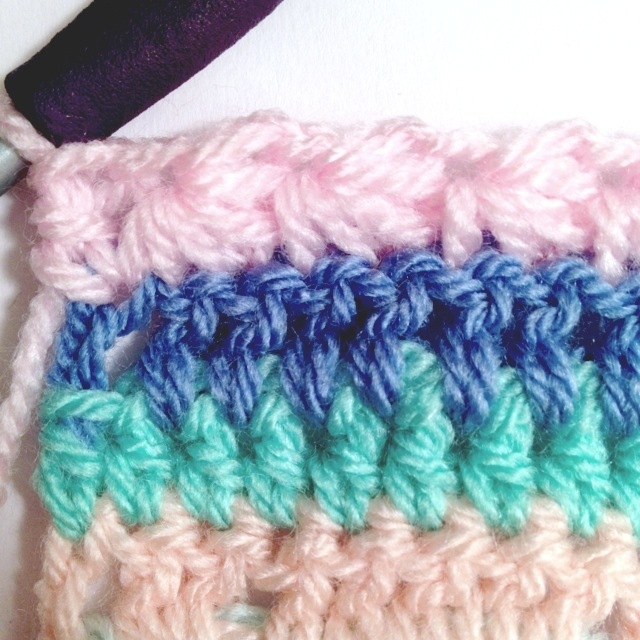 Im learning how to do a lot of new stitches and I got to row eight and did that one but my mind is not wrapping around the directions on how to do #9 row. I just cant get it. Any suggestions. It’s kind of like an upside down version of row #8. Is there a specific part that’s causing you trouble? Yes, sorry for the confusion. 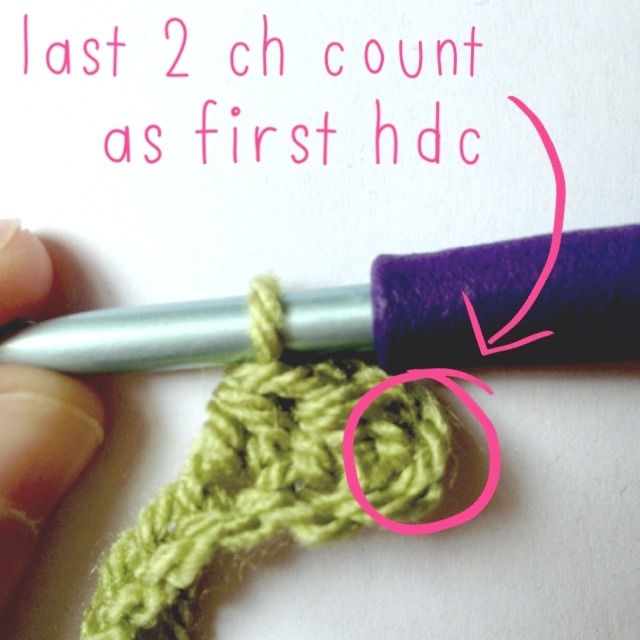 If there’s a row that says do hdc all the way across, ch 2 at the beginning and count that as a stitch (or 3 for dc, 1 for sc). I’m loving this. All the different stitches are so nice to learn, and so pretty whan done together. I’m doing Granny squares at the moment, using every different square I can find, and making up some of my own. I really should start putting them together soon, but will wait until it is much colder for that. 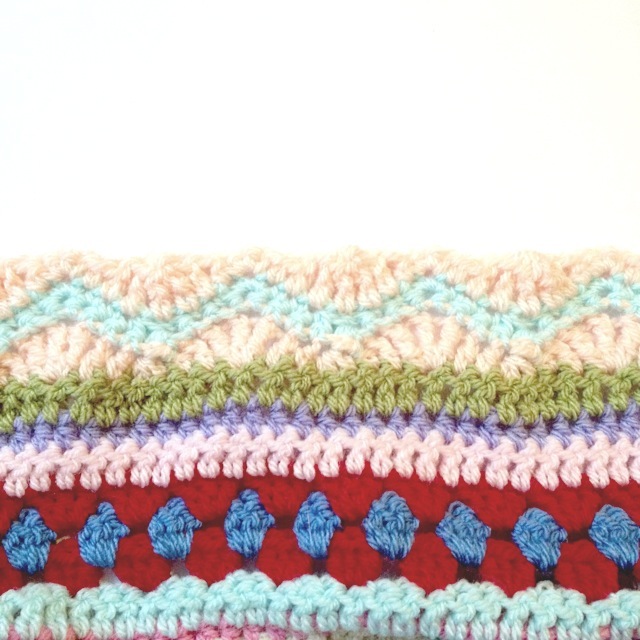 I am making this blanket right now! I love how cheery and engaging it is. I just finished row 10, the 3rd row of the Catherine Wheel part. Even though I went up to a J hook, and tried to make it loose, the Catherine wheel has pulled inward on the blanket and is making the work curve. Any ideas how to fix this, before I move on? I even added an extra ch to each cluster in row 9, but the whole thing is still pulling in hard. It was problematic for me too. It sort of fixed itself after some washing and using it for a while, but if you are hesitant feel free to leave those 4 rows out! Thanks! I think I am going to continue and hope that with pressure from the next rows, and blocking, it works out. I am enjoying this blanket SO MUCH, thank you again for sharing it and for being so kind as to answer questions. No problem, I’m glad you’re enjoying it! I have another question- I am at the end of row 28, the bobble row. 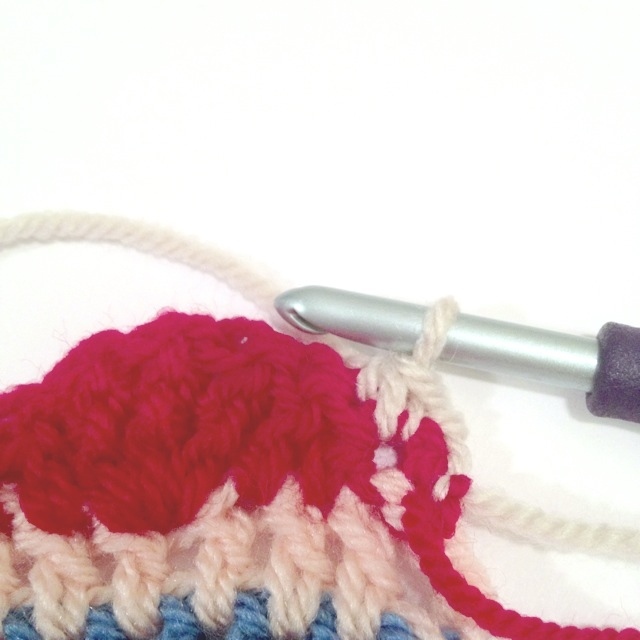 How do you tie off the bobble yarn? I don’t want to just leave it hanging, I don’t think it would stay put. Thanks! I’d just go ahead and weave it in. 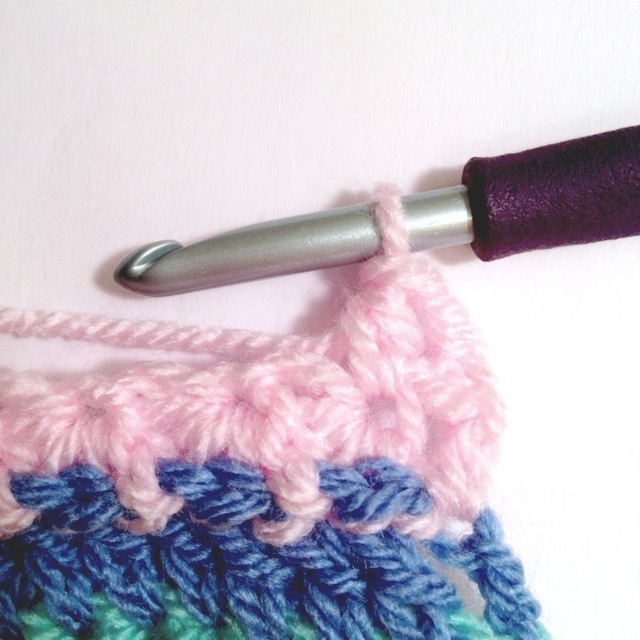 Maybe thread the needle then go back into the row, going around part of the post of the last stitch so it catches the yarn and you’re not just unraveling what you’ve done. Is there a pdf of this afghan? I found the pdf sorry. This is such a beautiful blanket which I have just started. I am so happy that I came across it. I have done 134 stitches, it is straight at the ends but seems to be buckling in the middle. What have I done please? Am I totally useless at crocheting? Thank you. love love this … I am currently on row 12. I am using different yarns colors for every row(except the ones that say use same color) and I am using some fuzzy type yarns as well,my granddaughter who turns 7 will love her new blanket. That’s a really neat idea to play with textures! I hope you continue to enjoy making it and I’d love to see a photo when you’re done! 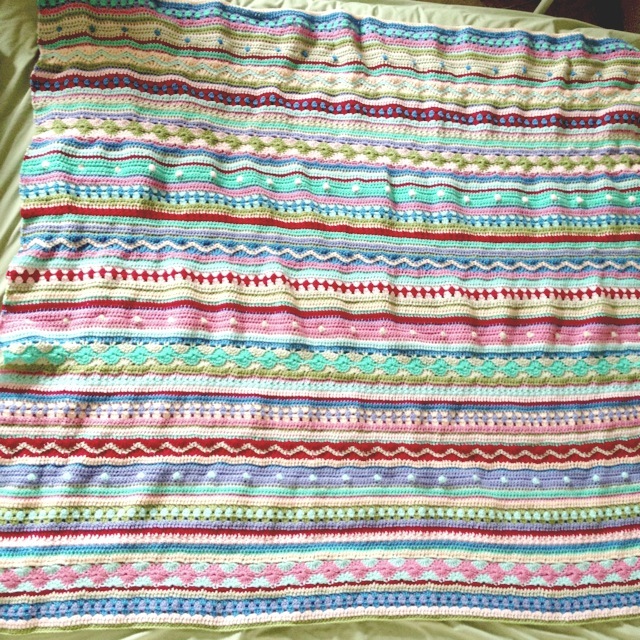 Hannah – the blanket is gorgeous! 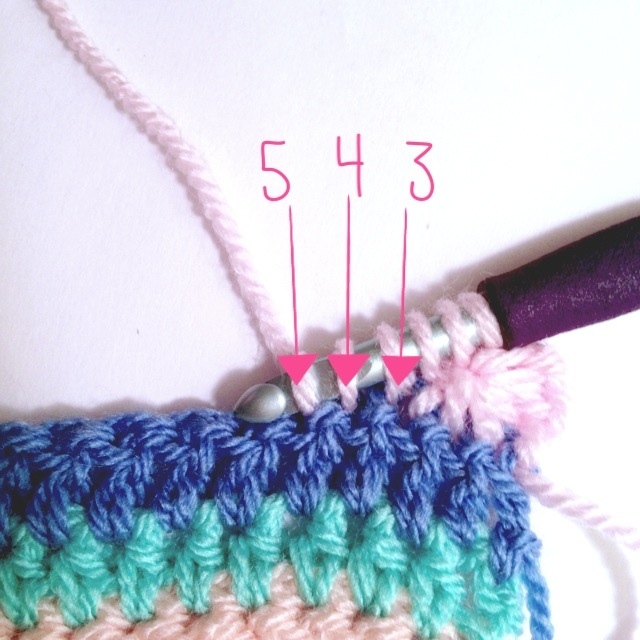 I love how you showed how to crochet each row step-by-step and even numbering the stitches. 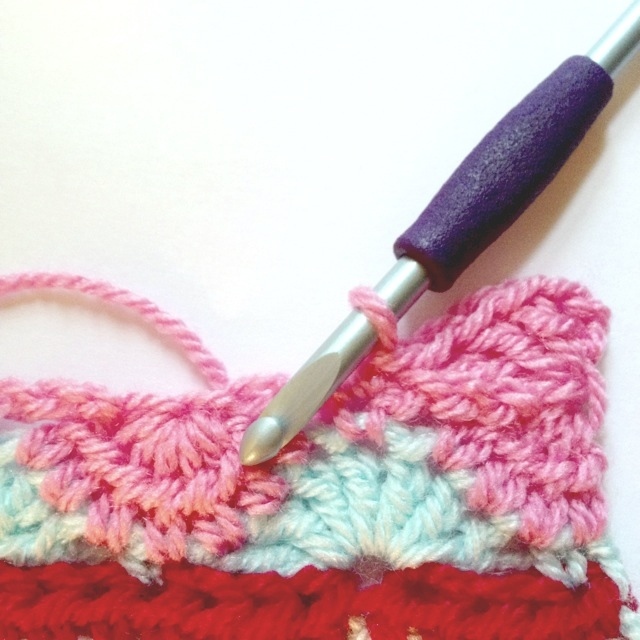 I’m attempting to crochet a small project and having these guides would help so much. 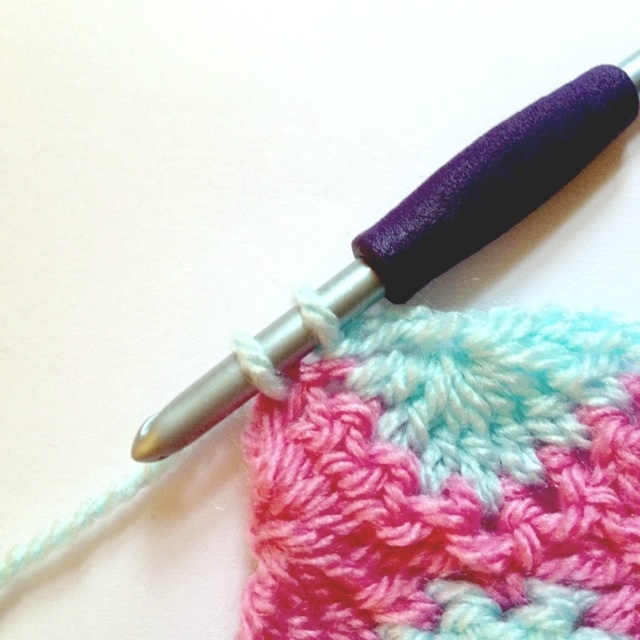 I knit more than crochet so the tips are needed. Thanks for taking the time to show your process. Hello from Germany. Found your pattern and will make it in black, grey and white. Starting next time! Thank you for your great idea. Ok. I have Finished last night! May I send you a picture? Hey I’m doing the blanket just now and loving it but somehow the section since the 2nd catherine wheel is far wider than the rest of the blanket. I’m still using the 5mm hook and still the exact same number of stitches yet somehow its wider. Any idea why? maybe my tension has gotten looser but do you think I’ll be able to block it at the end and that will fix it? 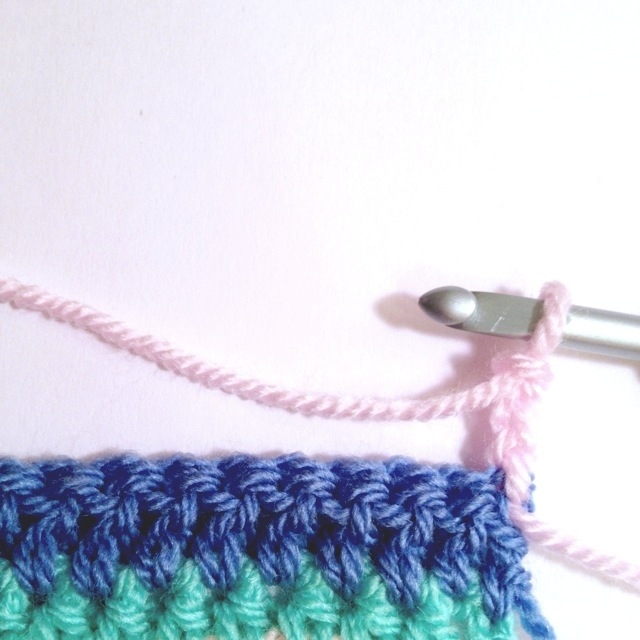 Hmm, if you’ve got the same number of stitches and are using the same hook as when you started then it must be a tension issue, but adding the border and blocking should certainly help (although I’m not sure if it’ll completely eliminate the problem). Hope this helps! Beautiful! 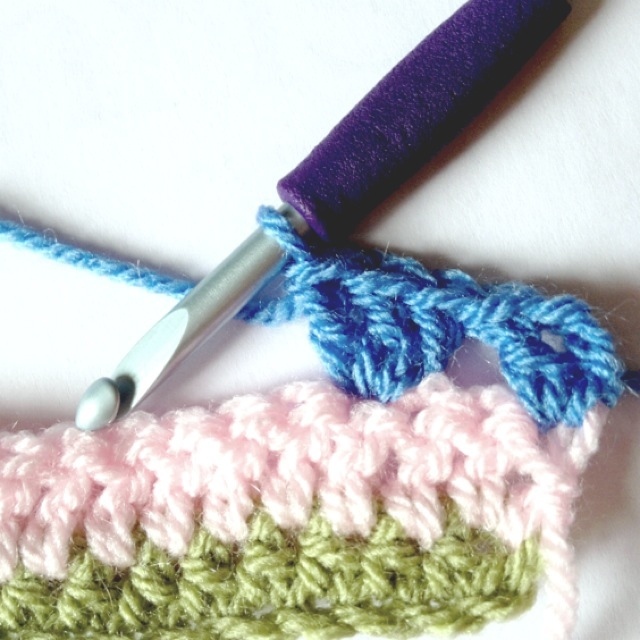 I have been crocheting off and on over the years. When I came across this blanket, I beleive it is the most beautiful chrocheted blanket I have ever seen. Thanks for the detailed instructions, but not sure if I can create one as lovely as the one you have displayed. I must ask, do you make blankets to sale, if so, how much? 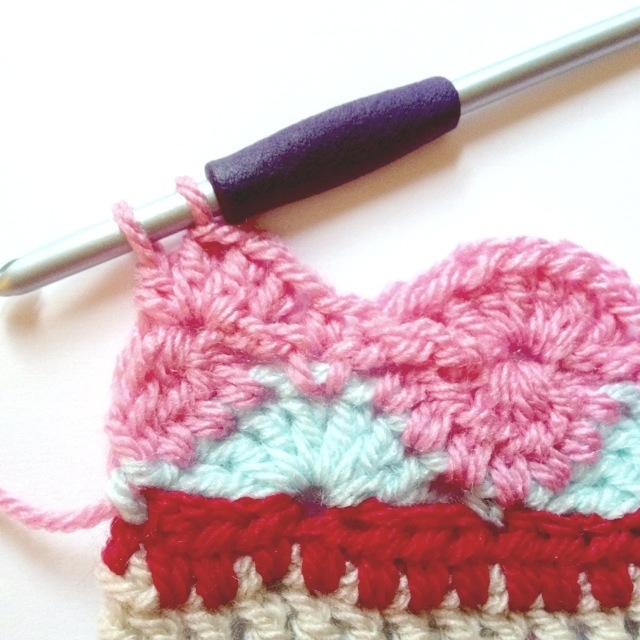 Love this pattern – will try it soon! Quick question…I always get confused with how to do color changes. 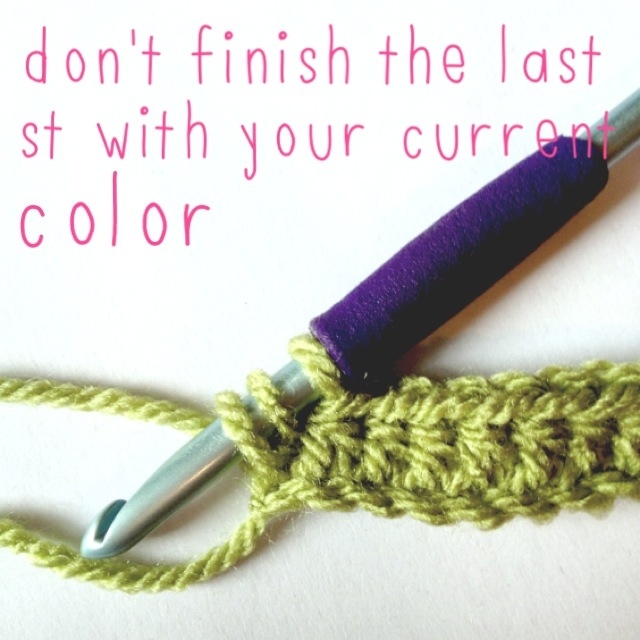 Do you tie the new color in (with a knot) or do you just pull it through the last stich, turn and crochet over (no knots)? Hopefully that makes sense. I’ve been turning and crocheting over the ends (no knots), but find that the ends of the yarn end up sticking up through the stitches (a few inches in from the side). Not sure how to solve this problem. Thanks so much again and I can’t wait to get started! Thanks! 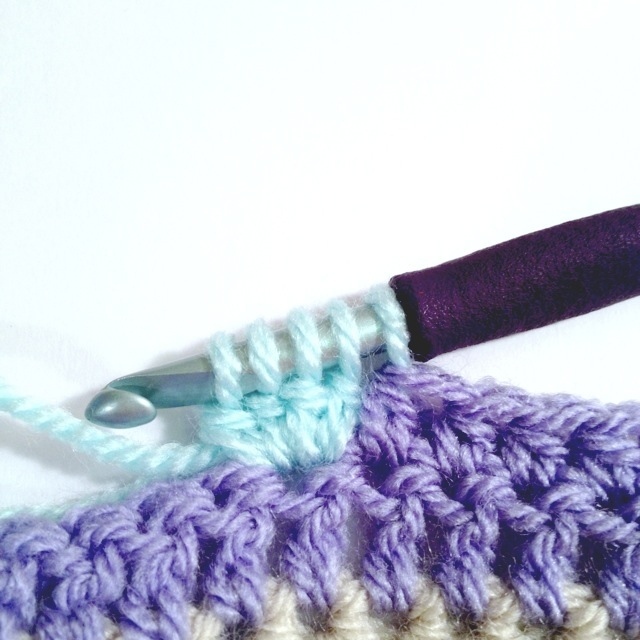 I usually crochet over the ends, too, unless there are gaps (like in the granny stripe rows), and then I sew the ends in. Hope that helps! Love your pattern. When making the bobble row, the bobbles don’t seem to stick out as much as your picture shows. Any tips? I’d add an extra stitch into them and then push them out a bit with my finger (since they sometimes go towards the back). Hope that helps! 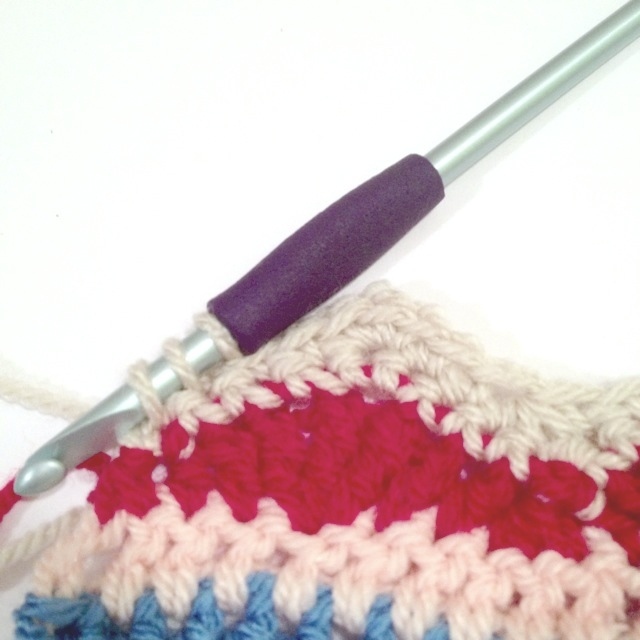 What is your opinion of crocheting over the ends when making the border. I don’t like seeing the ends when I work over them on each end of my work. Thanks for still replying to questions. I love this blanket! Wow, I just was looking blog like yours? Great, great, great! Your afghan/throw is stunning!! I have never crocheted or knit anything with so many color changes or stitches. I think it is high time I do!! You have definitely inspired me with the eye catching beauty of your throw. I have a wedding coming up in April and I think this just may be the perfect gift. Thank you so much for your wonderful pattern with not only text but also pictures!! What a lovely blanket I wish to do one as it is very well explained!Beautiful! No, I’m sorry, I don’t have any videos on YouTube. Wow! What an awesome, colourful smart design! 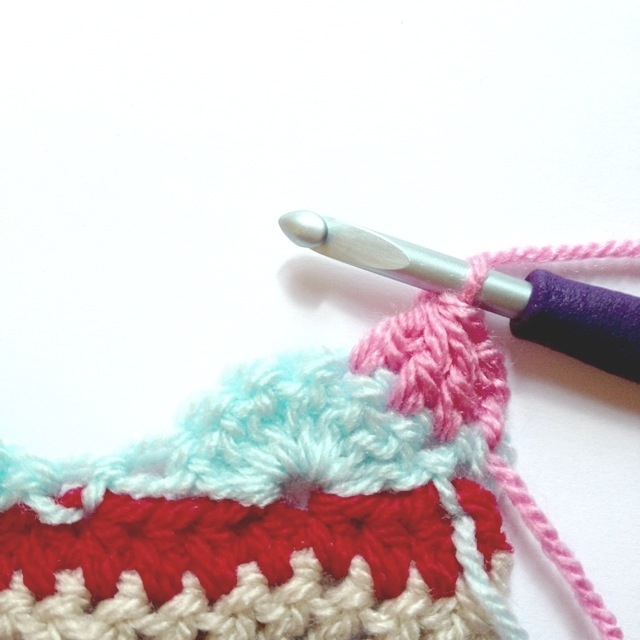 I’ve just come across your site and I love everything I’ve already seen… I’m not sure I’ll crochet the whole blanket (too much work for me at the moment), but sure I’d pick some parts to make a couple of wall hangings… want to redecorate with things made by myself. May I,please? Besides, thank you so much for sharing such patterns for free…. (Is this a correct way to say it?). 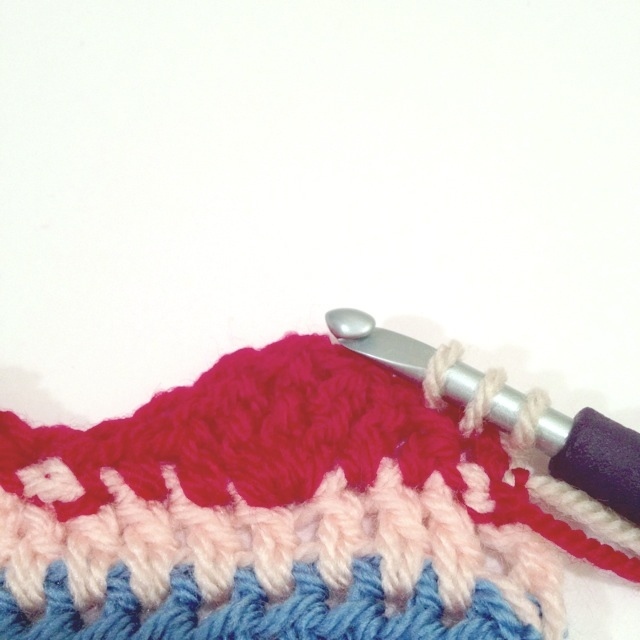 What are your red, blue, and white yarns that are used? How many of each? LOVE the pattern!!! Thanks so much for sharing! I’m MOST impressed, Hannah ! You’ve taken an enormous amount of trouble to give every scrap of input you can. What a good and clever person you are !! Thank you so much! I hope you’ve found it helpful! I’m really glad that you enjoyed it and that it helped you. Thank you for taking the time to comment! Can you do FDC instead of the chain 192 and the chain 2at the very beginning then HDC or DC? I believe that would work! 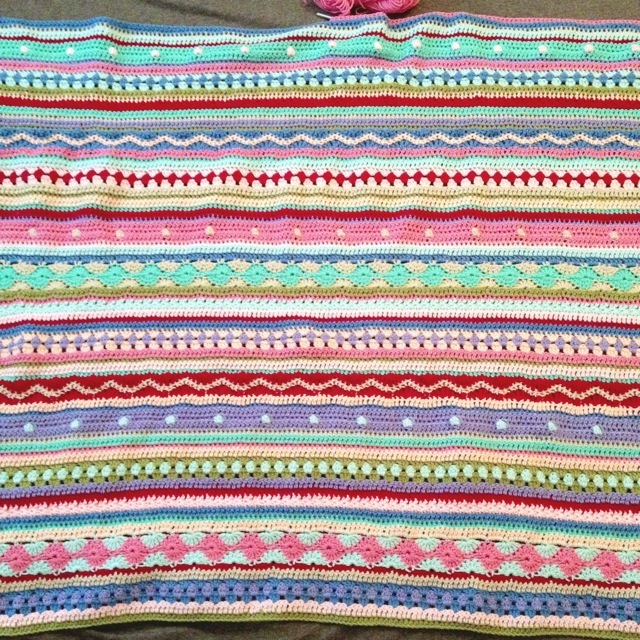 Can anyone advise please – how much yarn does this blanket use please? I have just completed a project using this yarn and have approx half of each ball left – will that be enough, or should I start with new balls? 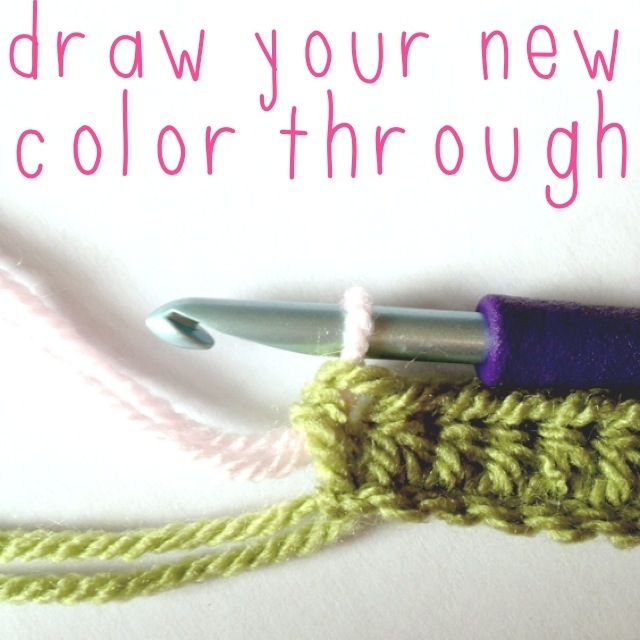 It depends on how many colors you have… but if it’s the same you’ll definitely need new yarn. I used all of what I had except for the border color. This pattern is amazing , looking for months for a blanket that would be special and I have found it, thanks for spending so much time developing it. do you have other designs that you have created? The granny stripes? Hmm, the blanket is naturally somewhat uneven on the sides due to the different stitch patterns but is usually fixed by both the border at the end and blocking. Hi from South Africa! Thanks for this happy colourful pattern! I am at the second cartwheel row. It seems like I am suppose to make a cluster of 8 if I am to crochet in every stitch? 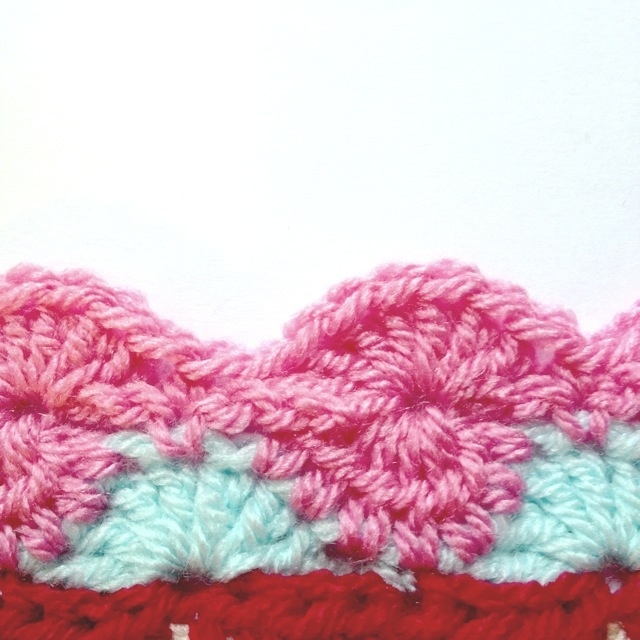 If I make a cluster of 7, there is still one stitch left before the top / middle stitch. Hope I make sense! 🙂 Can you please help? Yes, the first row only has 7 stitches, but even though I had 8 loop in my cluster each time, somehow it worked out and looks fine. Thanks for the reply. 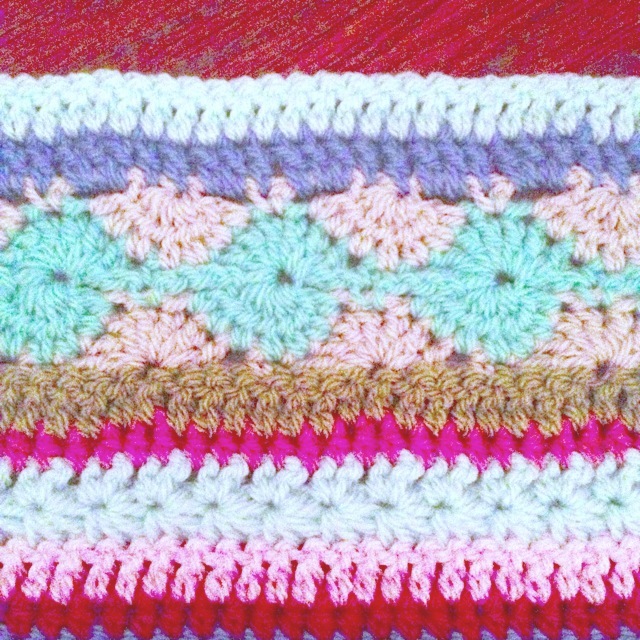 I started my blanket… I love how it’s coming out.. I can’t put it down. Thank you ! I’m glad you’re enjoying it! I’d love to see a picture when you’re done! I started a ‘crochet as you go’ blanket. I came across your sight and followed a few of your rows. Thank you for your lovely directions. I found them easy to follow and this gave me the confidence to try a few of my own rows. Thank you again. I have wanted to venture out and make a more complicated blanket and now I can! I’m sure it will take me a long time but I love your detailed instructions and photos. Thank you for taking the time to do this! Hi, Hannah, I need your help! 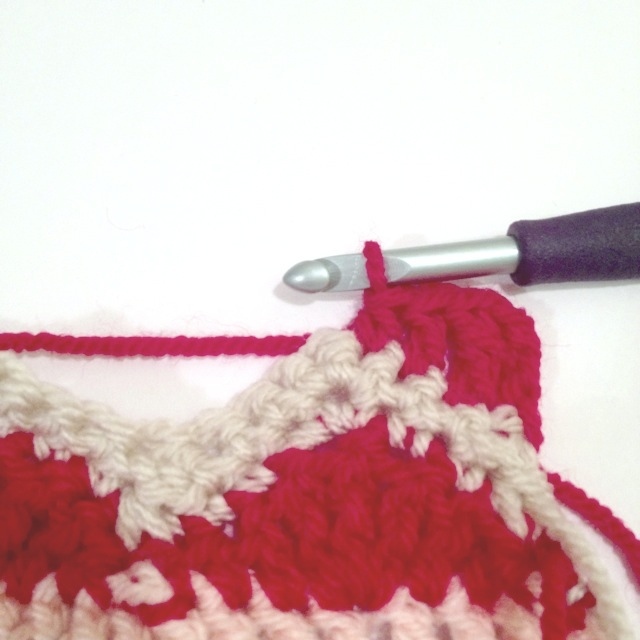 I can not do chevron stitch…. I finished the first mountain row, it seems it is right to me as I finished two stitch left and decreased. ( I have 193 stitches as you do). 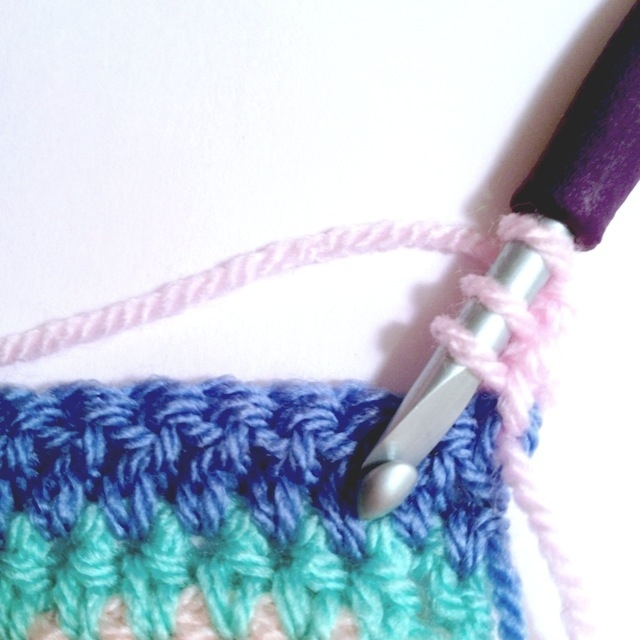 But I can not follow your second row of chevron stitch.. I don’t have enough stitches. The beginning of row 32 (the first mountain) is ok, when I try to decrease, I don’t have enough stitches. I have three sc on the top of 3tr, sc in the next two stitches, I have only one stitch before two sc stitches and top where I do 3 sc. I only have 5 stitches between top of mountain. Did I do wrong on the previous row??? Could you please help me???? 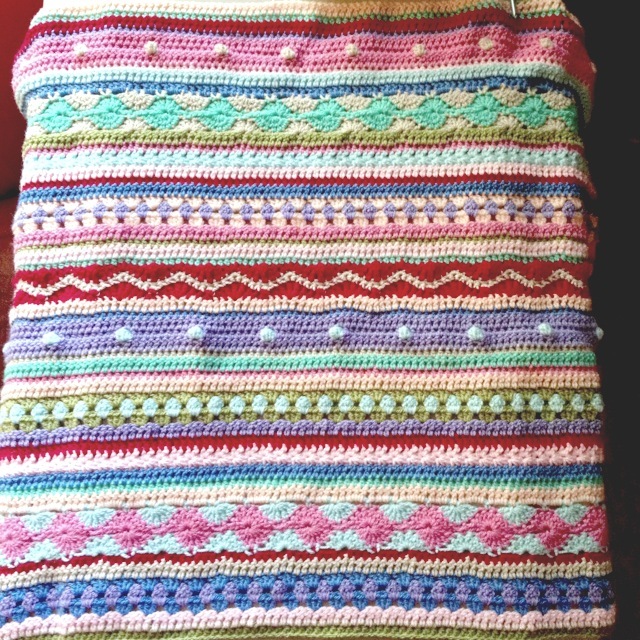 Hello Hanna – I have finally started on your beautiful blanket after “pinning” the pattern from Pinterest quite some time ago – even have ordered the wonderful Stylecraft yarn. 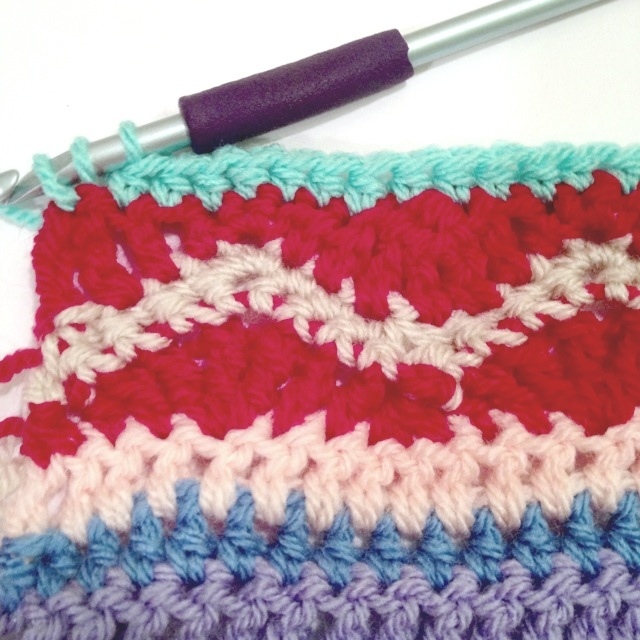 I’m now trying to do the Chevron/Ripple rows and have run into the same problem that the lady above ran into. Sorry to report that a your Row 32 is not correct. 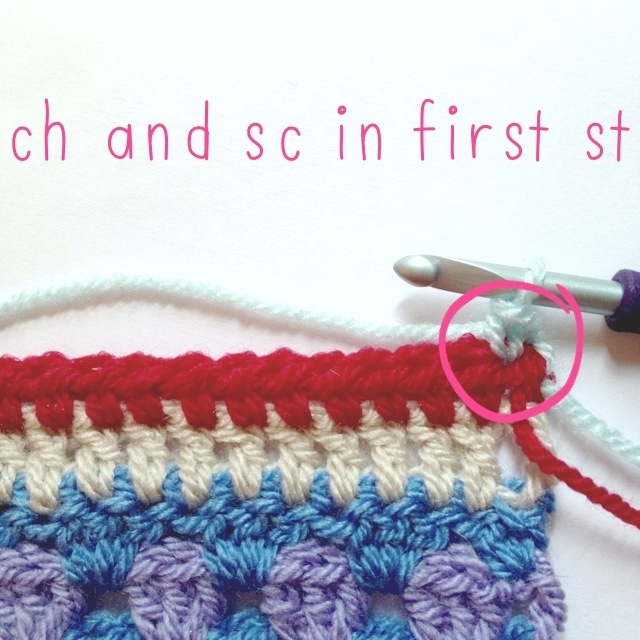 Where you state to “pull up 3 loops, yo and finish the stitch” it should read 1 sc, as decreasing 3 sts in Row 31 and Row 32 is decreasing 6 its between the two rows. Prior to this, I ripped out its, reread your instructions over and over – even read thru all the above comments to see if anyone else found this to be a problem. So I have done my own thing in Row 32 by sc 7 between the 3 sc at the top of the tri3 and finally come out the the 192 that I’m supposed to have. 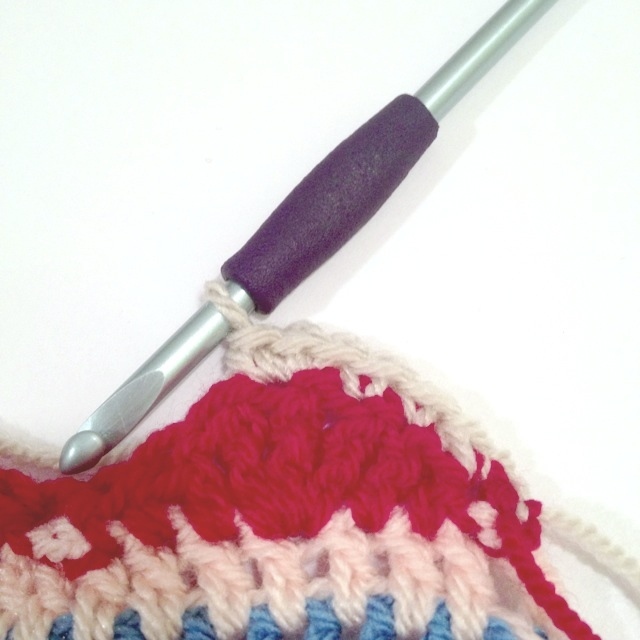 But thank you – I’m learning other new stitches and love that challenge. Wow! This is an amazing tutorial!!! I’ve been trying to find one like this!! Thank you so much!!! I’m really glad you like it. I hope you have fun making it! J’ai démarré ce plaid et j’aime beaucoup, merci pour ce tuto. Plus de détails sur mon blog si vous le souhaitez. I’m making this beautiful blanket as we speak! I’m on row 32, right in the middle of the Chevron. I’ve had a few issues, but with the help of enlarging the photos here and YouTube, I think I’ve finally gotten the hang of it. I’m not a very experienced at crocheting. Your letter caught my eye because my blanket is also going to my first granddaughter! I know your joy because I also had only boy grandchildren til my Lily came along April 2016! I’m over the moon about her! Found this pattern on Pinterest and have started my blanket – at row 32- loving all the different stitches though my bobbles didn’t turn out real puffy- any suggestions? Also would love to see the other blankets people have done but am not seeing the link that was talked about on down load pattern? Could you direct me to it? THanks! My bobbles weren’t very puffy either. 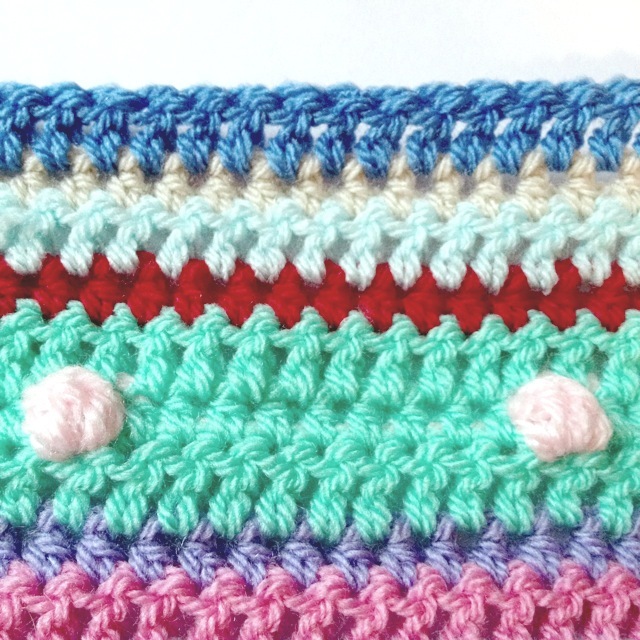 If you want them puffier you can try adding another stitch to it or changing it to a popcorn stitch. As far as the page you mentioned, I ended up taking it down because there were so many photos sent to me I couldn’t keep up. However if you check out the pattern page on Ravelry you can see a bunch of them! Hope that helps! Haven’t started yet, but your directions, photos, and diagrams are outstanding. Thanks. I’m considering doing this as a tempetrue blanket and am wondering how long your finished blanket was with the 131 rows and the 3 border rows? It’s hard to find something interesting that isn’t ginormous with 365 rows. I’d say it’s around 4 feet now that it’s stretched out a bit. If you go down a hook size I think you would be ok.
Hi saw your comment on the ‘as we go stripey’ crochet afghan. I was wondering if you ever did the temperature blanket? If so how long did it end up? OK I know this is old BUT I still want to thank you for the pattern and pics. 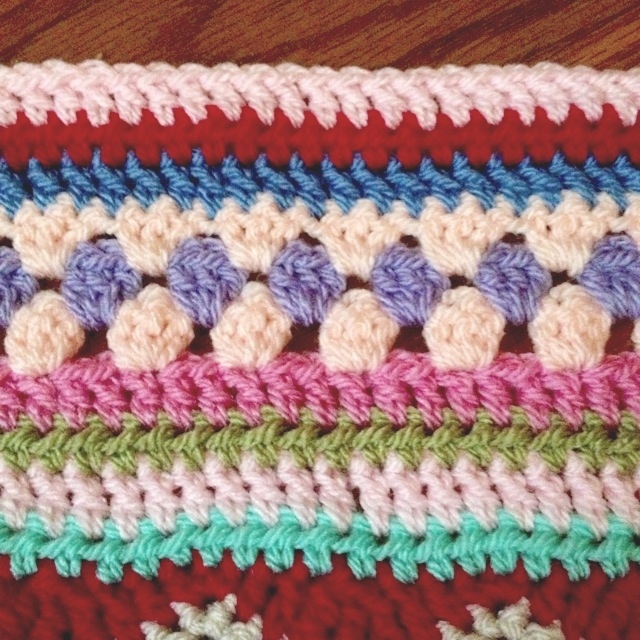 I have been wanting to make a blankie but my attention span is nonexistent. This is perfect for me! Dif colors and stitches the whole way through! Woo hoo! Just ordered the yarn, I’m going big. All still available btw. Thanks again, so sweet of you. Also the pics are awesome. I’m kinda newish so I’m sure I shall need some of them. ☺ Thanks! I have a problem with row 27 (Bobble row). 9 hdc and 1 bobble give exactly 10 stitches. How can you end up with 7? At 193, only 3 remain. Need urgent help. Maybe I misunderstood. 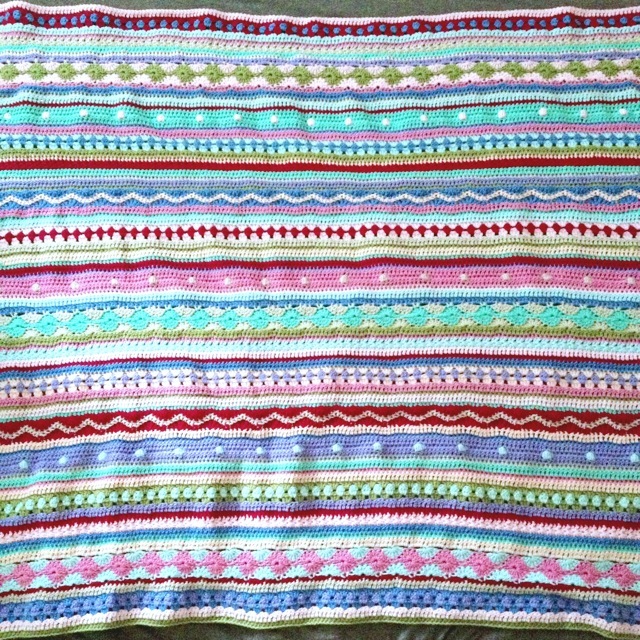 ROW !2 PROBLEM – I love this blanket! When I started it, I couldn’t stop because I couldn’t wait for the next row. I had no problems with rows 1-8. I have gotten to a standstill though because I’m having problems with row 12. I cannot get my stitches close together. I have spaces in places in between stitches which make the row look terrible. 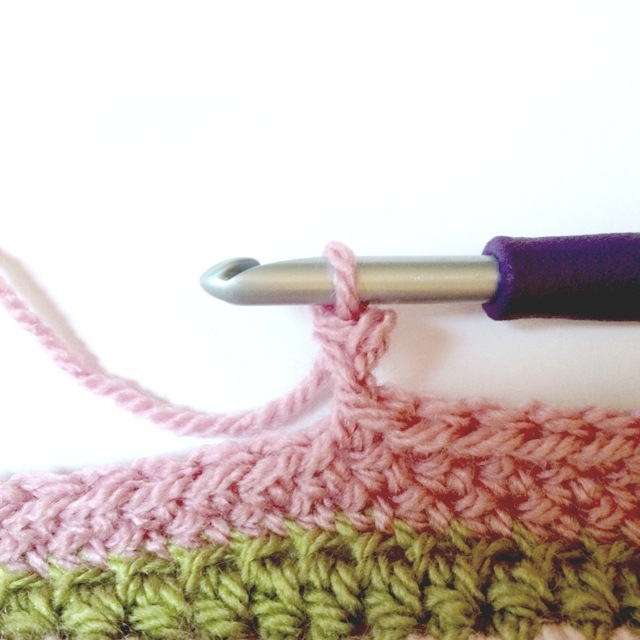 I did previous row 11 with a sized up hook so that the row would not curl up tight as instructed. I am going to have to pull out previous row(s) to try and fix this I guess. I hope I can. I had so much trouble with row 12 as well. I somehow just played around with it and did my own thing trying to get eight stitches in each Group. Are the directions correct in row 12 I think I’m probably just reading it wrong. I’m loving this pattern, but am confused by the ripple row. The written instructions say to put the HDC, DC and TC in separate stitches, but the picture looks like the DCs and TR are in the same stitch? 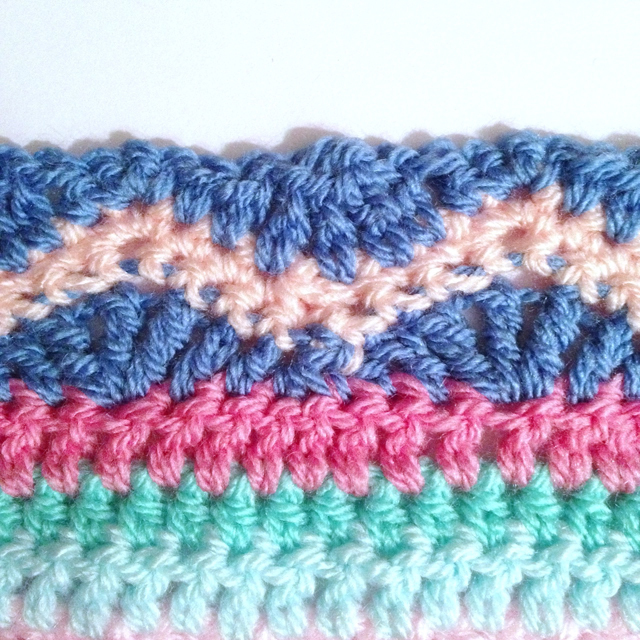 Either way doesn’t leave me with enough stitches for 2 SC in between the increases and decreases! Help! 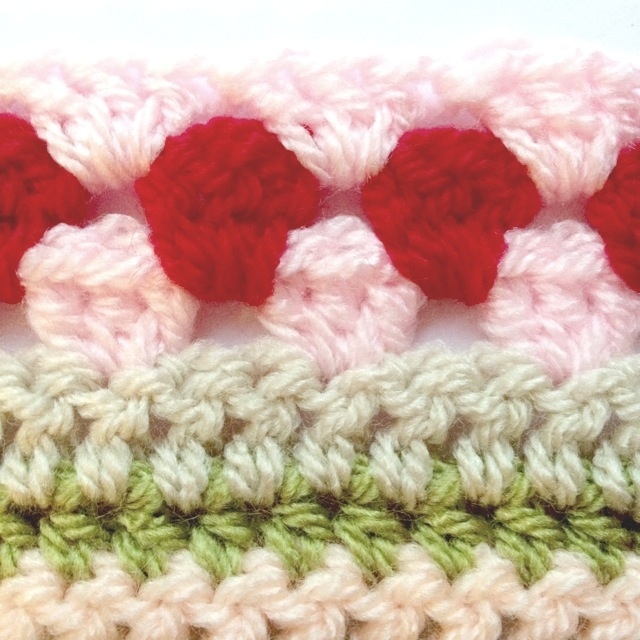 There are supposed to be 3 tr sts in the same stitch, but the dcs & hdcs are supposed to be in separate stitches. I know it’s kind of hard to tell in the photos because the red is so bright and kind of obscures details. Hope that helps! 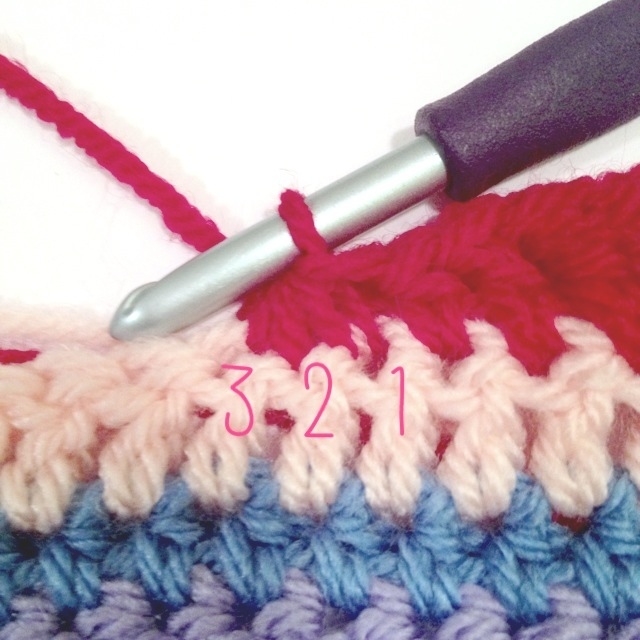 I also had trouble with the ripple stitch – row 31 did not work out number wise for me which threw off the number of stitches in row 32 and 33. I just did whatever worked out to get the pattern looking OK but in the end row 31 does not look good at all. 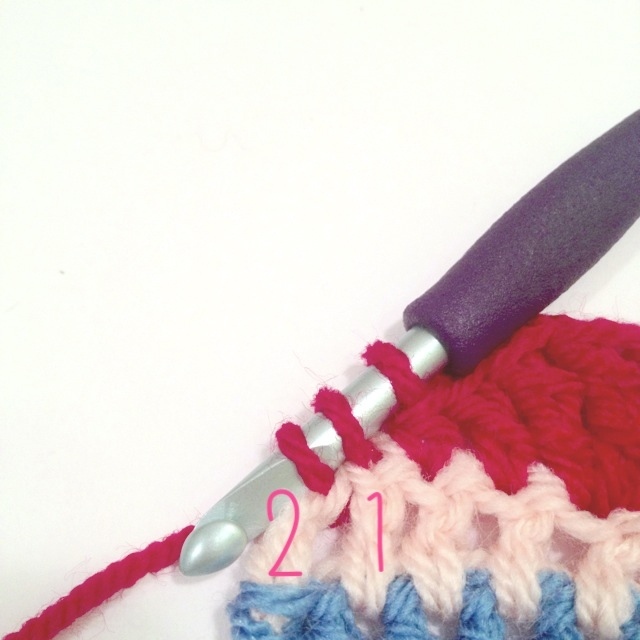 I tried it again in row 71 – 47 and really had the wrong number of stitches in #72. I’m sorry you had trouble with those sections. If you haven’t done a border or anything you can rip them out and skip them because the numbers in the rows before and after should match up. You could try that! 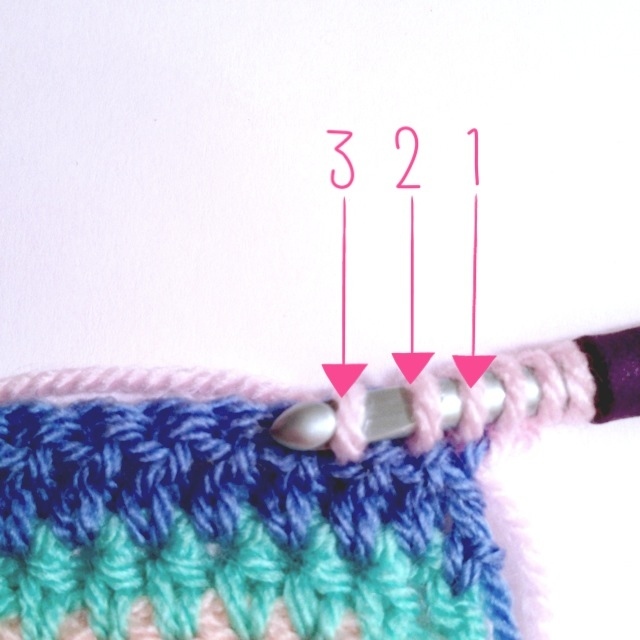 If you have removable stitch markers after you rip the row out you could mark every 10 stitches in the row below to make sure everything’s OK before you redo the row. Sorry you’re having trouble though. Let me know if it continues to be a problem and we’ll figure something out! I do not mind if the rows are messed up – it makes it not perfect – home made and every stitches done with love – so a few – or many – errors are ok with me. I am sure the errors are just the way I am reading the pattern as I am fairly new at this . I love this blanket – I am on row 160 I will send a picture when it is done. Thanks for this! I also have wonky rows but I think it gives it character. New at this as well. Hello. I just finished my blanket. It is huge and im pretty sure the sides are uneven but I dont care lol. I used neon colors and instead of weaving in my ends I tied them off. So its like having tassels on the sides. I just love it. Its actually the second blanket I have ever finished. 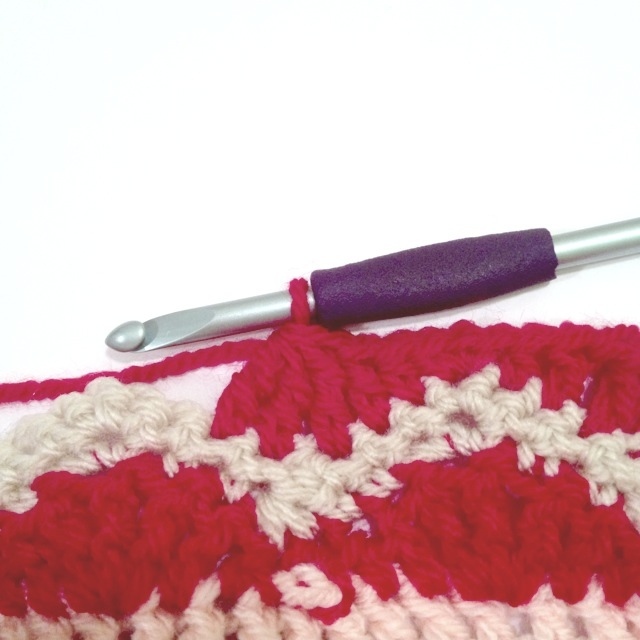 I have not been crocheting long and cannot read a pattern to save my life but with this I can. I printed out the pages with the pictures and put them in page protectors kind of like a book. 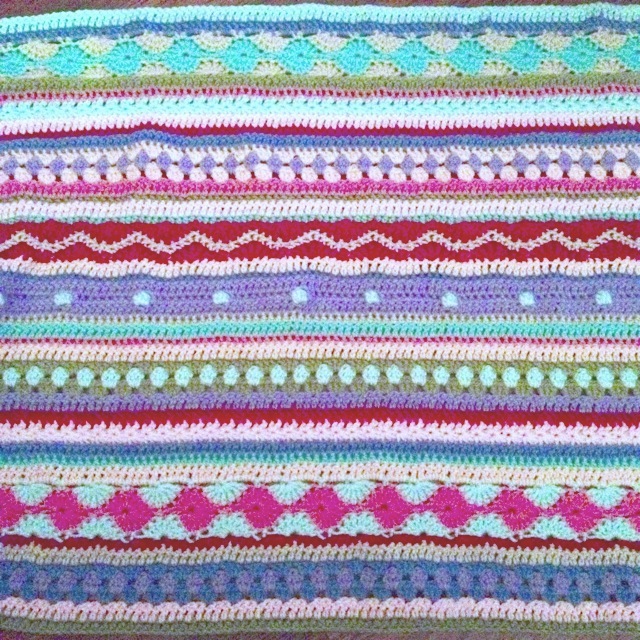 I loved this blanket so much Im going to start another one but in pastel colors. And it will be for my kids (who have already tried to stake claim on this blanket) so it wont have to be so big. 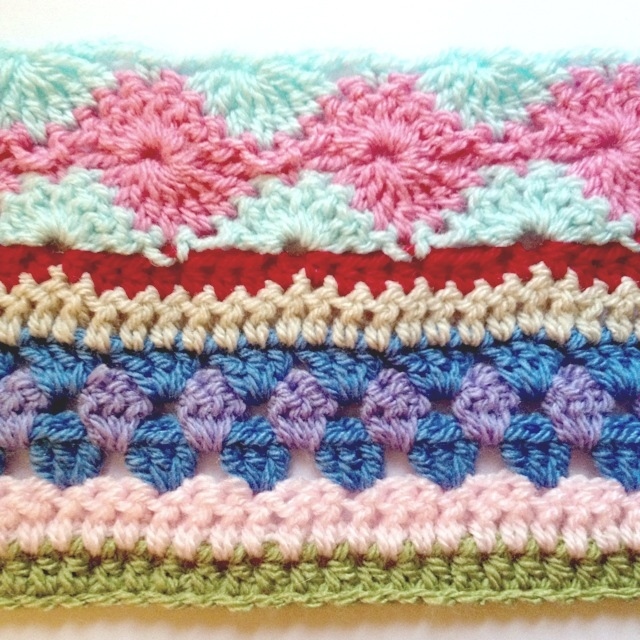 Thank you for posting this pattern!! I love the finished blanket and your pattern, photos, and directions are the best I’ve ever seen!! I’m making this soon!! I love your pattern, just had a problem with the Catherine wheels I didn’t like how they were lop-sided so I increased to 9 stitches. I’m frustrated and can’t figure out what’s wrong. I’m on my first bobble row 27. I then DC across row 28 and wound up with more than I started with by 34 stitches. Exactly the number of bobbles in the row. I have 9 stitches between each bobble except on the ends where theres 8. I started with 313 stitches. Help! I’m stuck. Should it be 8 stitches between bobbles? Just to let you know I’ve worked out the problem! I’m loving this! Thank you so much for this! It’ll be a treasured heirloom! Fantastic pattern, it was a joy to make, thank you. I love this pattern! I work on it when I become bored with my other 10 blanket wips. But they are Christmas gifts and I have to finish. I started with 20 rows from a you tube video, I didn’t really want to have to just repeat the 20 different, rows over and over, so I found your pattern. Luckily for me it has the same multiples. I think after I finish my wips I’m going strictly for these types of blankets. You don’t get bored when its constantly changing! Thank you so much for the pattern! I’m actually doing 2 of these, 1 in cotton and 1 in acrylic. More or less stash busting. How long was it at 131 rows? A beautiful blanket with the clearest instructions I have ever seen. Thankyou so much. Do you have this on utube? We were going away for a break, my partner asked me to download the pattern for this stripey blanket. I did this (lots of pages and lots of ink used in the process). She is a very competent crochet knitter and began to do it as soon as we left in the train. She did the first row, it looked very nice then she became completely stuck and frustrated because all directions were in American English and were impossible to understand for her, so she is left with a lot of wool and a very short unfinished stripey blanket. 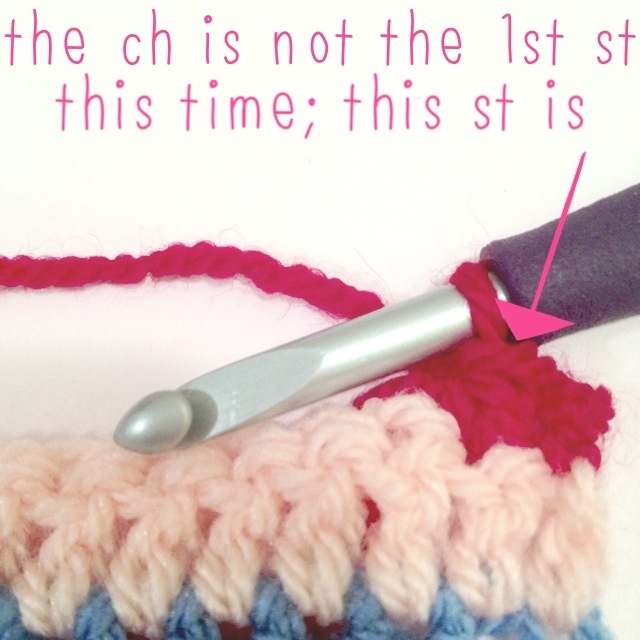 I feel it should be pointed out on the web-site that this may not be understood by British crochet knitters. I’m sorry this happened! It actually is on the website that I use American English but I guess that’s something I need to add to the actual PDFs as well. Thanks for pointing this out! 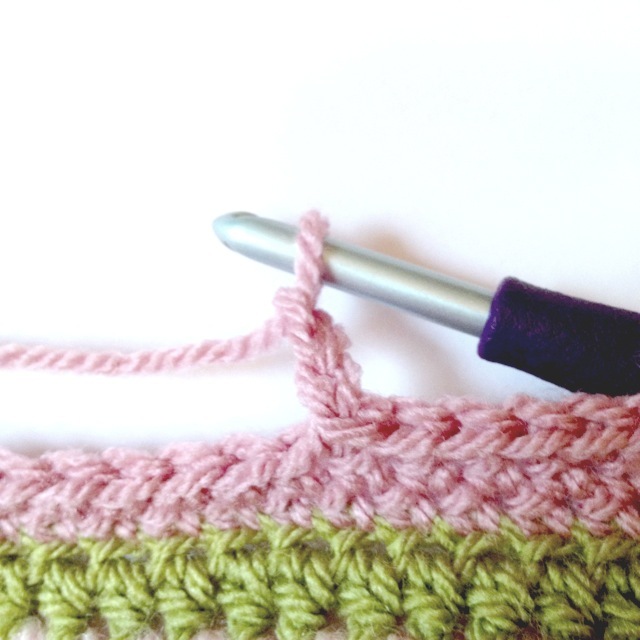 When working the HDC and the DC rows… should the last stitch be worked into the chain from the previous row? 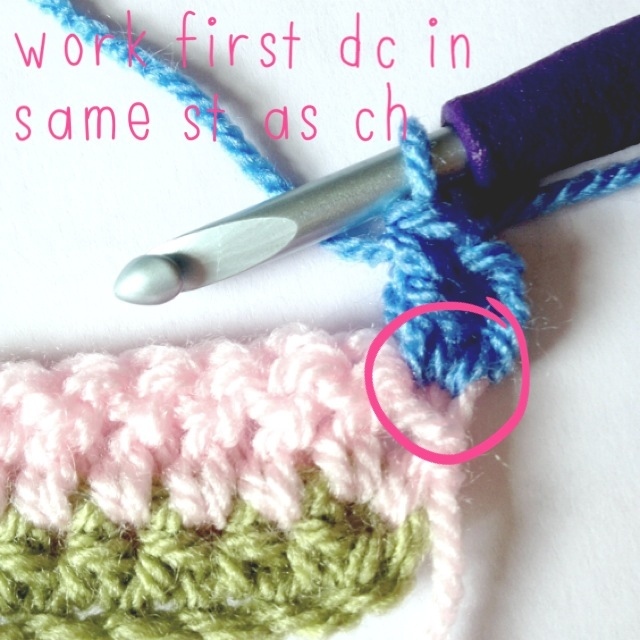 When working the HDC and DC rows… should the last stitch be worked into the top of the chain from the previous rows? Cindy, I’m so glad you’re enjoying the pattern so much! It was my goal to make it as clear and detailed as possible so it’s great to hear that the pattern is easy to understand. I can’t wait to see the photos! This is an amazing instruction! All my gratitude that you share this for free! What a work you must had, taking all the pictures. And it ’s great: I am from Begium, speaking dutch, and a chrochet dummie. Merci infiniment pour ton patron. Avec photos et très bonnes instructions cela fait de vraies merveilles.